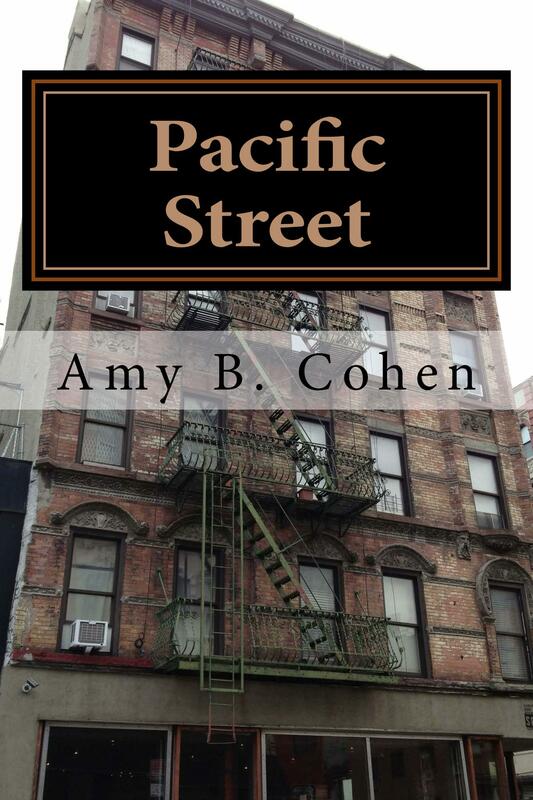 I was recently interviewed by Bernadette Duncan on Pioneer Valley Radio about my novel Pacific Street and about genealogy research in general. I hope you find it interesting. You can buy my book here. Before I return to the other children of my three-times great-uncle Abraham Goldsmith, one more post inspired indirectly by his son Milton. My final post about Milton referred to the comment in his 1957 obituary in the Philadelphia Jewish Exponent that Milton remembered when Abraham Lincoln was assassinated in 1865. I noted that Milton was only four years old at that time. One of my readers commented that he also could remember a traumatic event from when he was four, and another reader shared her first memory from when she was two and a half. That made me think about the first specific event that I can remember in my own life. I have earlier vague memories, but this is the first clear memory of an event. 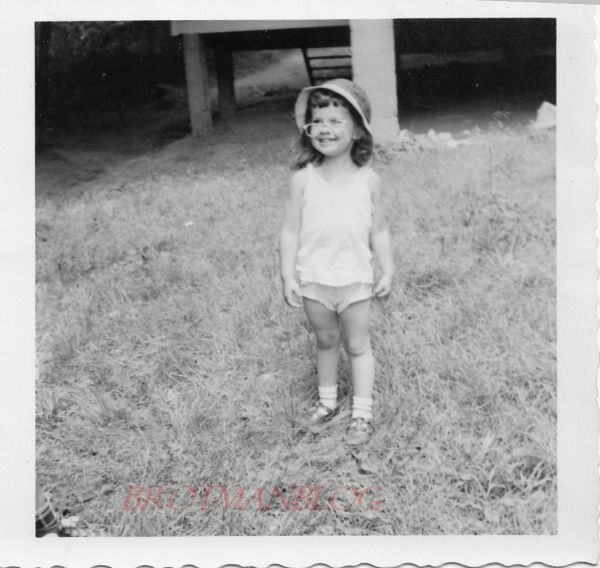 I was almost three years old at the time, and my family was spending the summer near Mahopac, New York, on a pond called Long Pond. My aunt and uncle were also there, as were my grandparents. We went to Long Pond for three summers when I was very young. My father and my uncle would return to New York City during the week for work and then come back to Long Pond on weekends. I learned to swim at Long Pond, and I mostly have very vague sense-memories of the place, reinforced by photographs and my uncle’s old home movies. But the one specific event that I remember very clearly from that third summer at Long Pond was the evening I followed my cousin Jeffrey into the woods. Jeff, who was nine that summer, was my childhood idol. He was six years older than I was and the oldest of the first cousins, all of whom adored him. I have written about Jeff before, here and here, for example. He was smart and funny and lovable; he could always make us all laugh. My entire family was heartbroken when Jeff died from cancer fourteen years ago. That summer at Long Pond, Jeff was friendly with another boy his age whose family was also staying at Long Pond. I can’t remember that boy’s name, but for simplicity’s sake, let’s call him Joe. Joe had a younger brother who was about six. Let’s call him Sam. One evening after dinner, Jeff and Joe decided to take a walk in the woods near our cabins. I wanted to go with them. I remember Jeff very pointedly telling me that I was too little and that I could not come with them. I was hurt and sad and probably made a stink, but Jeff and Joe wandered off, leaving me behind with Sam, Joe’s six year old little brother. Then Sam said that we could follow Jeff and Joe, and so off I went, just three years old, following a six year old after two nine year olds. (This was in the days before helicopter parenting.) Before too long, I tripped over a log and fell on a sharp piece of glass, cutting my wrist very close to the vein. I have no real memory of what happened next. Did Jeff coming running back and rescue me? Did my parents hear my screams and coming running to see what happened? All I know is that someone took me to a doctor nearby, who put butterfly clamps on my wound. To this day, I still have a very nasty two-inch scar on my right wrist. I was never really bothered by the scar, In fact, at times when I was growing up, it helped me differentiate right from left. My mother used to tell me that someday my husband would buy me a wide gold bracelet to cover the scar. But I almost never thought about it as a child, and now I rarely notice it; nor does anyone else. When I do look at it these days, I feel very fortunate that I avoided what could have been a much more serious injury. But mostly I look at it and remember with love my cousin Jeff. He may only have been nine at the time, but he was right. I was too little to go walking in the woods in the dusky light of summer that evening. What is your earliest memory? How old were you? The Great Harry Coopersmith Mystery (Almost) Solved! 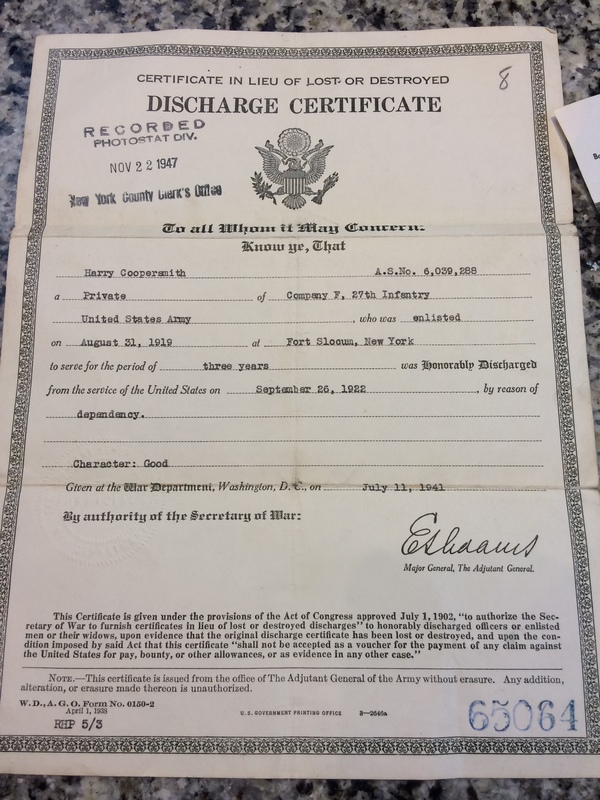 Back on December 5, 2017, I wrote about the documents I’d received from an Ancestry member named Dale: the death certificate of Frieda Brotman Coopersmith, my grandmother’s sister, and the military discharge papers for her husband Harry Coopersmith. Thanks to my fellow genealogy bloggers, I re-examined these documents more carefully and observed a few things I’d missed before. What was happening in the 1940s that would have prompted Harry or one of his sons to order these two documents? As Luanne Castle of The Family Kalamazoo pointed out in her comment on my prior post, there must have been some reason that these documents were ordered and why the military papers were recorded with the city clerk. I’ve yet to figure out the reason, however. In that last post, I went through all the possible theories that Dale and I had discussed about how these papers could have ended up in her father’s possession. Dale had no idea who Harry or Frieda were; she found me through Ancestry because they are both listed in my tree there. Dale thought at first the source was her great-aunt Anna Yurdin Haas, but my research and analysis led me to conclude that that was not the likely source as there was no apparent connection or overlap between Harry and Anna and Burton. Instead, I concluded that it was more likely that the connection was between Dale’s father Howard Halpern and one or more of the sons of Harry Coopersmith from his second marriage: David, Lawrence, and Samuel. Howard grew up in Long Beach, Long Island, New York, just a mile away from Island Park, Long Island, New York, where in 1940 the three Coopersmith brothers were living as boarders in the home of Jacob and Pauline Davis. After that post was published, I received several suggestions and questions from my readers. Two, Su Leslie of the blogs Shaking the Tree and Zimmerbitch and Charles Moore of Moore Genealogy, pointed out that sometimes things end up in the hands of complete strangers through random events and that there might have been no relationship between the Halperns and the Coopersmiths. Others suggested more questions to ask Dale and Harry’s grandson Stan. I contacted Dale and Stan and asked them some more questions. On the “random distribution” theory Dale told me that her father had been an avid stamp and coin collector and met many people while pursuing those hobbies; he also purchased stamp collections from other collectors. She suggested I ask Stan whether anyone in the family collected stamps. And when I asked Stan, he responded that his father Lawrence had in fact been a stamp collector. Perhaps this was how the papers ended up with Howard? Did he purchase a collection from the Coopersmiths in which these papers had been left inadvertently? Stan told me that his father had gone to a trade school in Manhattan to become a typesetter and had settled in Seaford, New York, on Long Island after he married. Stan’s uncles David and Sam owned a printshop in Freeport, New York, and lived with their families in Wantagh, New York, towns that are also on Long Island. Stan also said that his grandfather Harry was living in Bohemia, New York, also on Long Island, at the end of his life. Learning of these details, Dale pointed out that her father was a reporter for the Long Island newspaper, Newsday, and that her family had lived in Levittown, not far from Wantagh and Freeport. It thus was possible that her father knew the Coopersmiths from work or from stamp collecting. To see if I could get more answers, I decided to try to contact some of Harry’s other grandchildren, whose names I found in the obituary of one of David Coopersmith’s children. I found two of them on Facebook, and one, David’s daughter, Mindy, was able to provide me with some critical information. Comparing this photograph to one of the photographs Dale had sent me, I could see that both photographs were of the same man: Harry’s oldest son David. 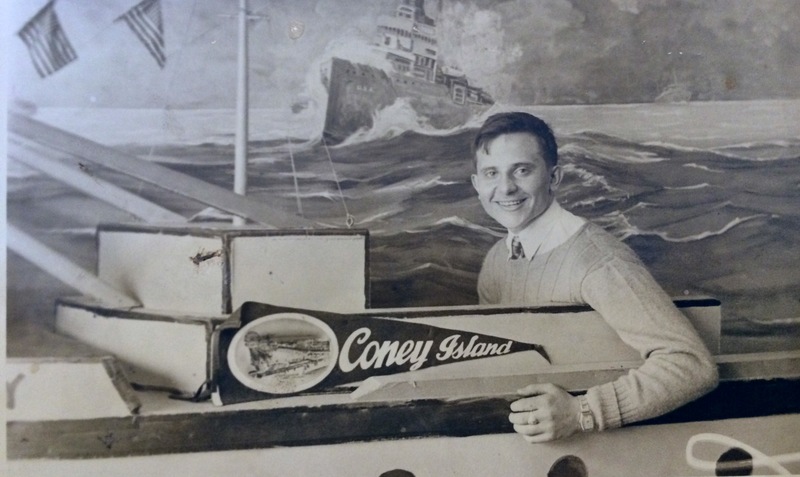 Mindy believes that the other photograph—of the man standing behind a Coney Island sign—is her uncle, Larry Coopersmith. Now I knew who the men were in those two photographs—two of Harry Coopersmith’s sons. Then one of those incredible small-world coincidences occurred. The next day I received an email from my friend and fellow genealogy blogger, Sharon Haimovitz-Civitano of the Branches of our Haimowitz Family Tree and Branches on Civitano Tree blogs. She had been on Facebook and noticed that I had commented on a photograph that Mindy had posted and wanted to know how I knew Mindy because Mindy was her very close childhood friend. My head was spinning! Sharon said that when she’d read my earlier post about Harry Coopersmith and seen the “mystery photos,” she had in fact thought that one of them resembled her friend Mindy’s father, but she had dismissed the idea, thinking it was too far-fetched—-that Coopersmith was probably a common name and that there was likely no connection despite the resemblance and the fact that Sharon and her friend Mindy had both grown up on Long Island. I asked Sharon to vouch for me—to assure Mindy that I was honorable and only interested in figuring out who was in the photographs and how they’d ended up with Dale’s father. And she did, and just a short while later, Mindy called me, and we had a lovely chat about our overlapping families. 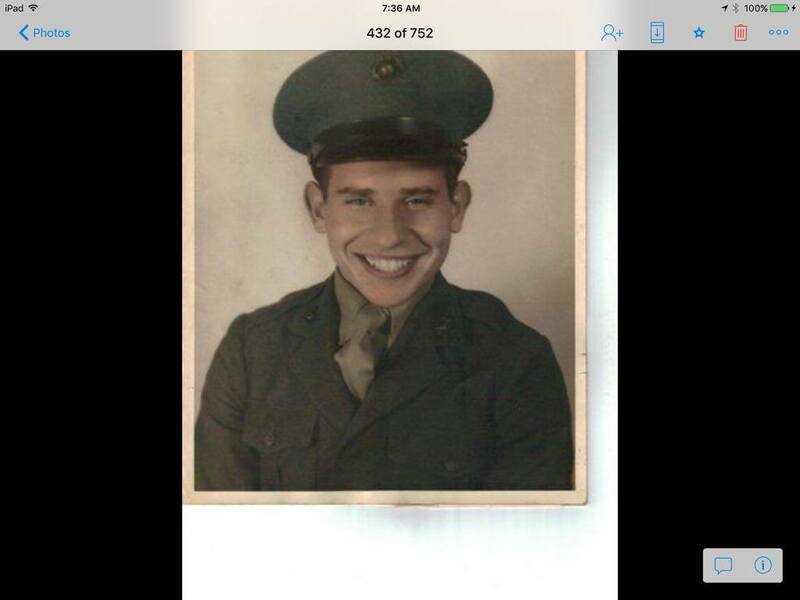 Mindy told me that her father David had been in the Marines during World War II and that the photographs were taken in the 1940s—consistent with the answer I’d received from Ava Cohn, the Photo Genealogist. Mindy had not known about Harry’s first marriage, and she also did not know who Howard Halpern was or how these photographs and other papers could have ended up with Howard. Mindy suggested that I speak with her mother Vivian for more information. The next day I spoke to Vivian, and she confirmed what Mindy had told me and also filled in more of the gaps. After Nettie was hospitalized, Harry could not find anyone to help him care for his sons, who were all under five years old at that time. He eventually decided to place them in the Hebrew Orphanage in New York City, and the orphanage found the Davis family to act as foster parents. 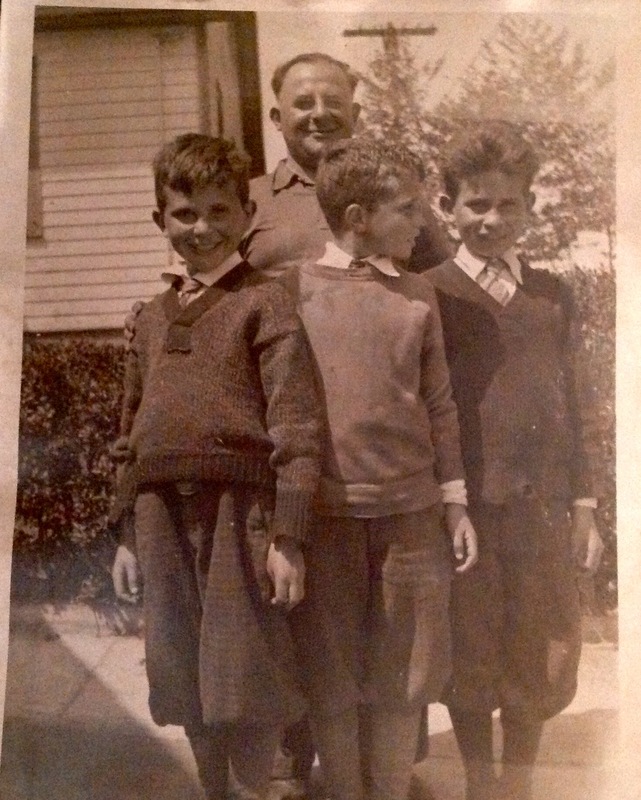 David, Lawrence, and Samuel went to live with the Davis family as small boys and lived there until the two older boys were old enough to join the service during World War II. Vivian also told me that Harry had himself been a stamp collector and that when he died in 1956, his son David had inherited the stamp collection. David, however, was not a collector so he gave the collection to his brother Sam, who was. Perhaps Sam or one of his children sold Harry’s stamp collection without ever knowing that there were papers and photographs inside. Vivian and Mindy generously shared with me some photographs of Harry and his family, helping me put faces to the names of this family who were not biologically connected to my own, but whose story was nevertheless tied to my own. We may never know how Howard Halpern ended up with the photographs of David and Lawrence, Harry’s discharge papers, and Frieda’s death certificate. It might have been a random event—through, for example, a sale of a stamp collection. Or maybe he knew the Coopersmiths from school or from the community or from work. But somehow he came into possession of these items and kept them safe for a long time. Thus, the mystery is not completely solved, but the most important questions have been answered. We know the identity of the men in the photographs, and now I can return them to their family. I know more about Harry and his life after Frieda died. And best of all, I’ve found some wonderful people who are connected to me through the tragically brief marriage of Harry Coopersmith to my great-aunt Frieda, my grandmother’s little sister who died far too young. 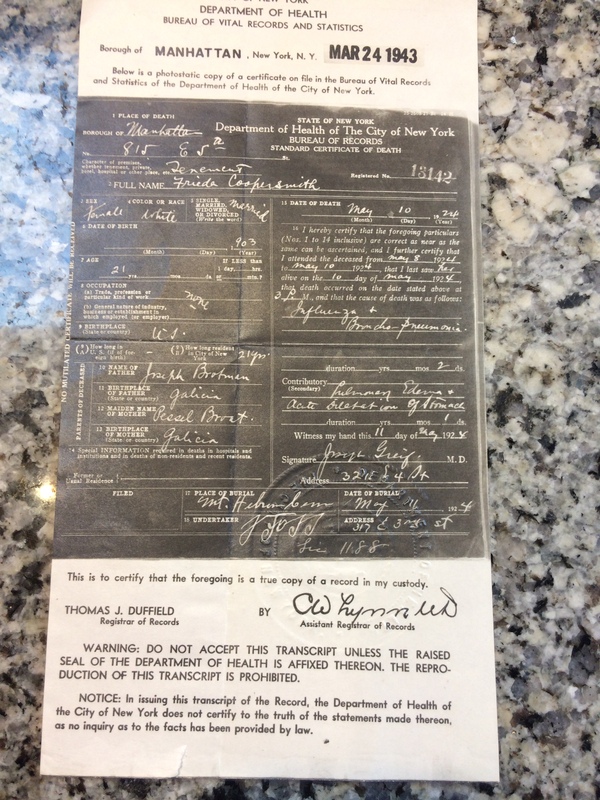 How Did My Great-Aunt Frieda’s Death Certificate End Up There? This is a mystery without a solution—yet. Perhaps one of you can help me solve it. Many months ago I received a message on Ancestry from a member named Dale who told me that she had a stamped and certified copy of the death certificate for my great-aunt Frieda Brotman. Frieda was my grandmother’s younger sister, and she had been married to Harry Coopersmith for about a year when she died shortly after giving birth to their son Max. Max had died as well. 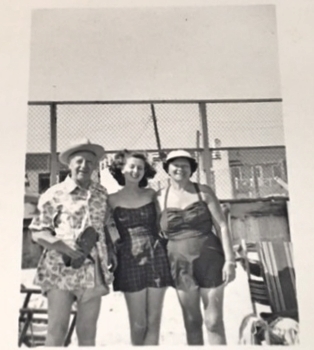 Dale had been going through her parents’ papers and found not only Frieda’s death certificate, but military records for Frieda’s husband Harry Coopersmith and two photographs that Dale thought might be of Harry. She had seen that I had Frieda and Harry on my Ancestry tree and wondered if I was interested in the papers. Well, of course, I was more than interested. Dale kindly offered to send me the documents and photographs. And since then we have been trying to figure out why these papers would have been among her parents’ belongings. Since both of Dale’s parents have passed away, she had no one to ask. Dale believed that these papers had belonged at one time to her great-aunt Anna Yurdin Haas. Anna was her father’s mother’s sister. 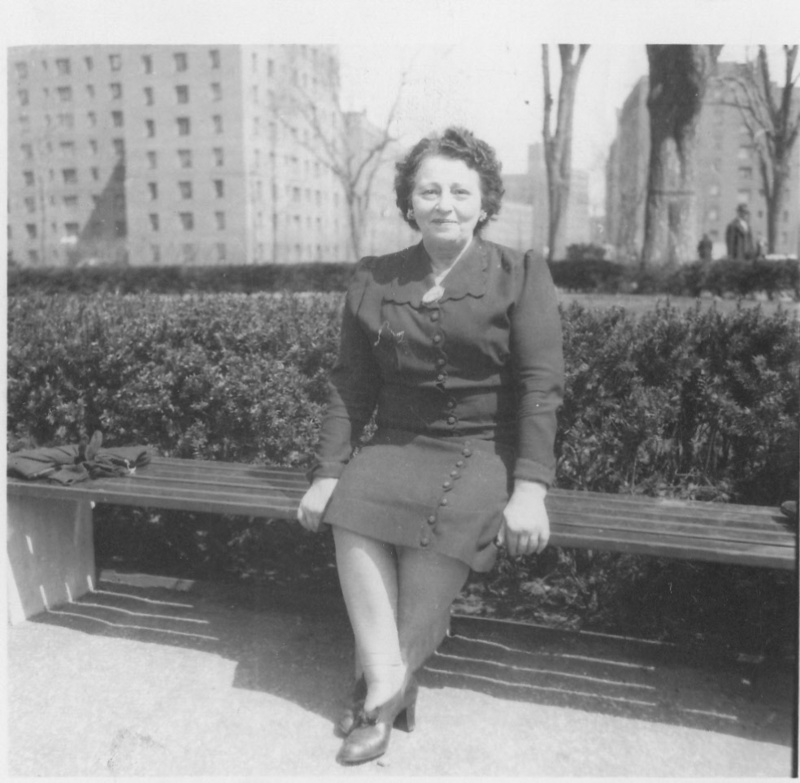 She was born in New York City to Russian immigrant parents in about 1895 and had lived in upper Manhattan as a child; in 1920 when she was 25, she was living with several of her younger siblings in the Bronx, working as a clerk in an office. On the 1930 census, Anna reported that she was married to Burton Haas, and they were living at 7035 Broadway in Queens. Burton Haas came from a whole different class—he grew up on Central Park West in Manhattan; his parents were American born from German and Austrian backgrounds. He went to Dartmouth. He served overseas during World War I, enlisting on June 14, 1917 and being honorably discharged on May 6, 1919. According to the 1930 census, Anna and Burton had been married about eight years in 1930, meaning they had married in about 1922. There were no children living with them. Burton was a real estate broker, Anna a cashier for a theater. In 1940 they were still living in Queens at 35-30 73rd Street and had been in the same place in 1935. There were still no children. Burton was still a real estate broker, and Anna was the assistant treasurer of a theater. Then things get a little odd. On August 9, 1940, Burton Haas and Anna Yurdin were married in Norfolk, Virginia. At that point they had in fact been living together and holding themselves out as husband and wife for almost twenty years. But perhaps they had never really married until 1940. On his World War II draft card in 1942, Burton reported that he had his own business at 62 West 45th Street in Manhattan; they were still living at the same address in Queens. Burton died a year later on July 21, 1943, in Queens. Anna died in 1983; they are both buried at Linden Hill Jewish cemetery in Ridgewood, Queens. Anna never remarried. Comparing this to Harry and Frieda’s timeline, I see no overlap. 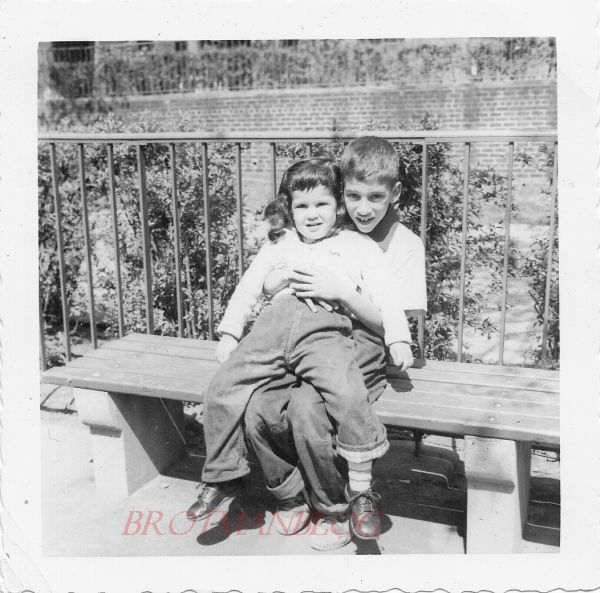 While Anna grew up in upper Manhattan and then lived in the Bronx and finally Queens and Burton also grew up in upper Manhattan and went to college, Harry and Frieda were both born and raised in the Lower East Side. 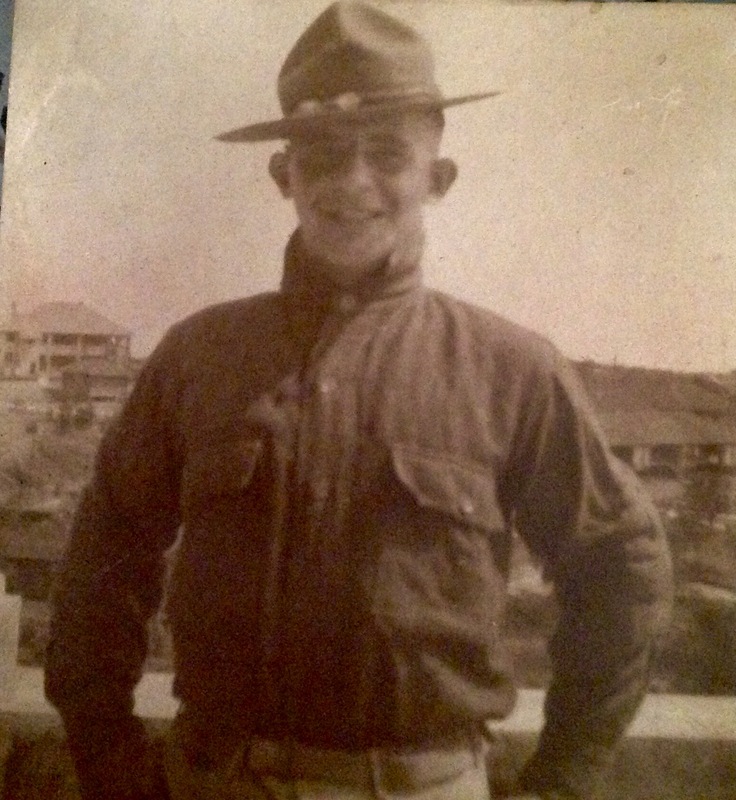 Harry had served in the US Army from August 31, 1919, until his honorable discharge on September 6, 1922, so he did not overlap in the service at all with Burton Haas. Harry married Frieda in 1923. Frieda had worked in a sweatshop as a finisher with feathers until she married Harry. They were still living on the Lower East Side in a tenement when she died on May 10, 1924, just days after giving birth to their son Max. After Frieda died, Harry quickly married again. He married Nettie Lichtenstein sometime in 1924, presumably outside of New York City as no marriage records were located for them. 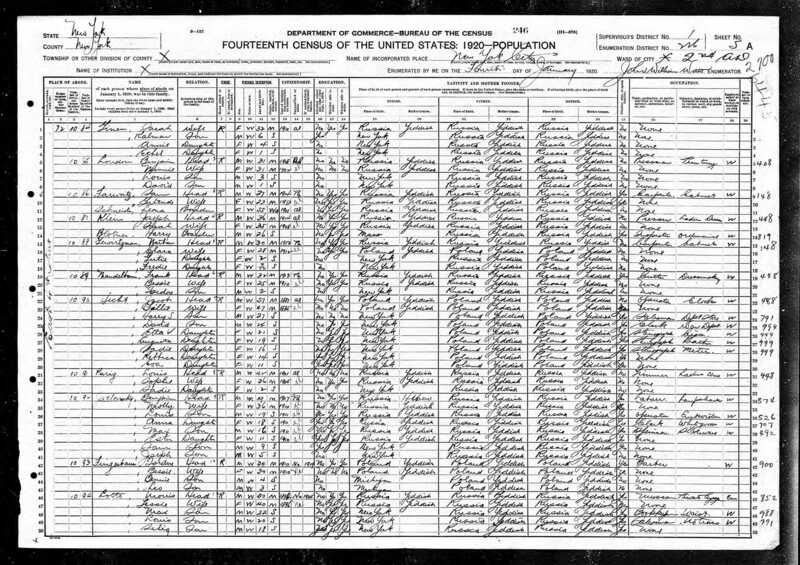 Nettie was a recent immigrant; according to the 1930 census, she had arrived in 1920. 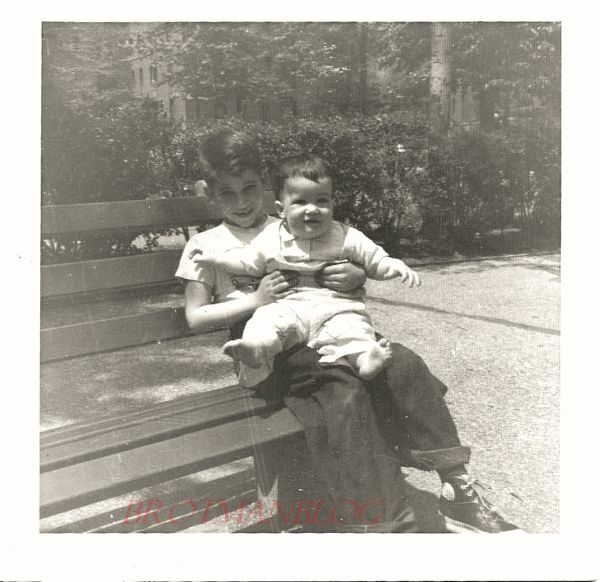 Their first son David was born on June 16, 1925 in Hoboken, New Jersey. Two more sons followed— Lawrence in 1926 and Samuel in 1928, both born in New York. In 1930 Harry and his family were still living in the Lower East Side. Harry was working as a taxi driver. By 1940, Harry’s family was in pieces. Nettie was institutionalized at Kings Park State Hospital in Smithtown, Long Island, and the three boys were living in Island Park, Hempstead, Long Island, as boarders (I assume as foster children) with the family of Jacob and Pauline Davis and their sons. I have not found any familial connection between the Davis family and Harry or Nettie. Jacob was in the printing business, and he and Pauline had been living in Island Park since at least 1930. Before that, they had lived in the Bronx and upper Manhattan, nowhere near Harry or Nettie. I have no idea how they ended up with the three Coopersmith boys. Neither one ever lived on the Lower East Side. 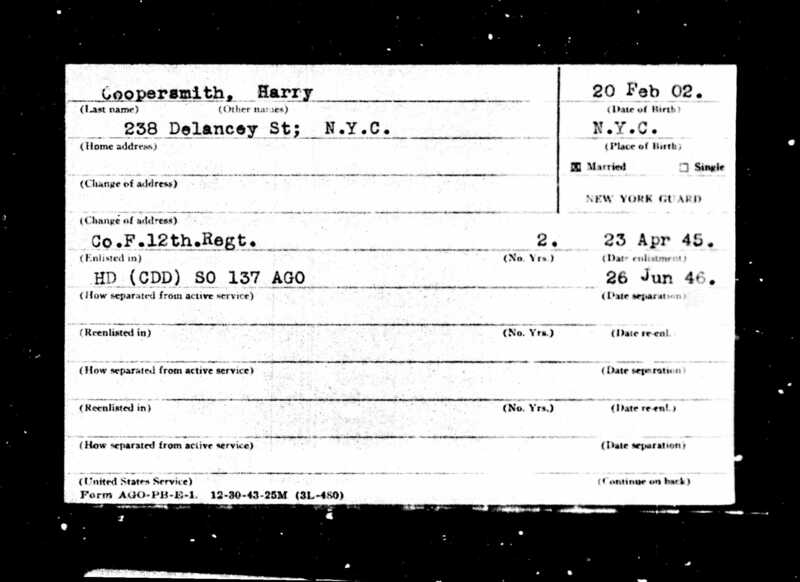 Harry does not appear anywhere on the 1940 census and does not resurface on any records until 1945 when military records report that he was still living on the Lower East Side and had enlisted in the New York Guard on April 23, 1945 and had been discharged on June 26, 1946. The last records I have for Harry are his veteran’s burial records, showing that he died on January 14, 1956 and was buried at Long Island National Cemetery in Farmingdale, New York. Interestingly, a plot next to Harry was to be reserved for his widow Nettie, who was then residing in Bohemia, New York, also on Long Island. I don’t know if Harry had been living with her at the time of his death. Given the absence of any overlap in places lived or worked between Harry and Anna Yurdin Haas or Harry and Burton Haas, I have no idea how or why Anna would have come into possession of Harry’s military papers or Frieda’s death certificate. As for the two photographs, I am not even sure that they are pictures of Harry. I sent them to Harry’s grandson, but he had never met his grandfather and did not have any pictures of him. He sent me a picture of himself, and perhaps there is some slight resemblance, but not enough to determine if the photographs are of Harry Coopersmith. 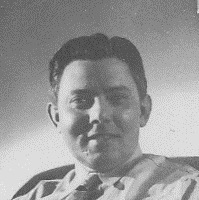 Assuming they are photographs of Harry, they were likely taken in the 1940s, according to Ava Cohn, the expert in photography analysis. That would mean that the person who somehow came to possess these documents knew Harry in the 1940s. 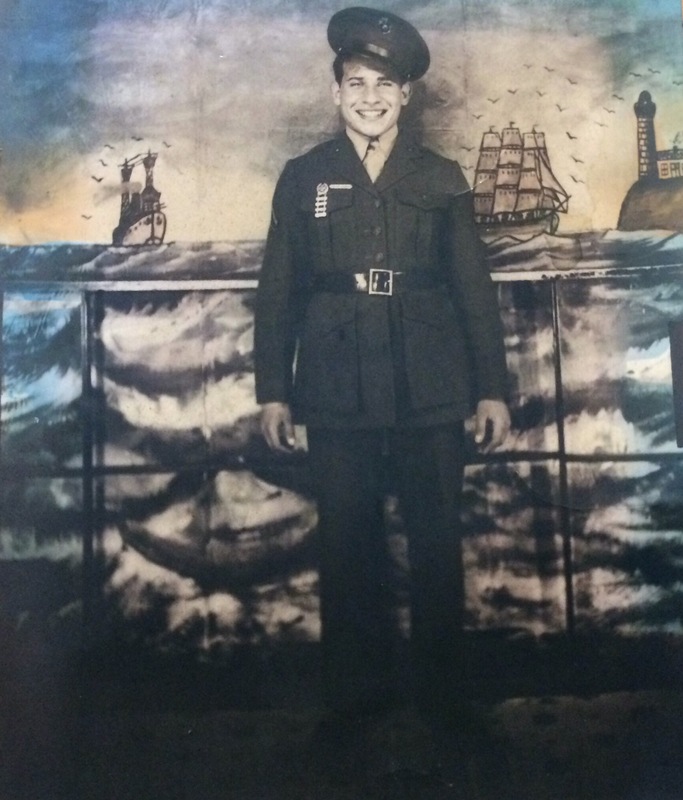 He is in his military uniform in one of the photographs, so that means the photograph was probably taken some time in 1945 to 1946 since that was when Harry was in the New York Guard. At that point Anna Yurdin Haas was a widow, living in Queens, New York. Perhaps she and Harry somehow became friends or lovers. After all, Harry’s wife Nettie was institutionalized, his sons were in foster care of some kind, and Harry was on his own. That seems like one possible explanation for how these papers ended up in Anna Yurdin’s possession. The other possibility is that the papers never belonged to Anna Yurdin, but perhaps to Dale’s father Howard Halpern. Dale is not entirely certain that they had belonged to Anna. If they belonged instead to her father, how would he have known Harry? Howard Halpern was the son of David Halpern and Anna Yurdin’s sister May Yurdin (sometimes identified as Mary). 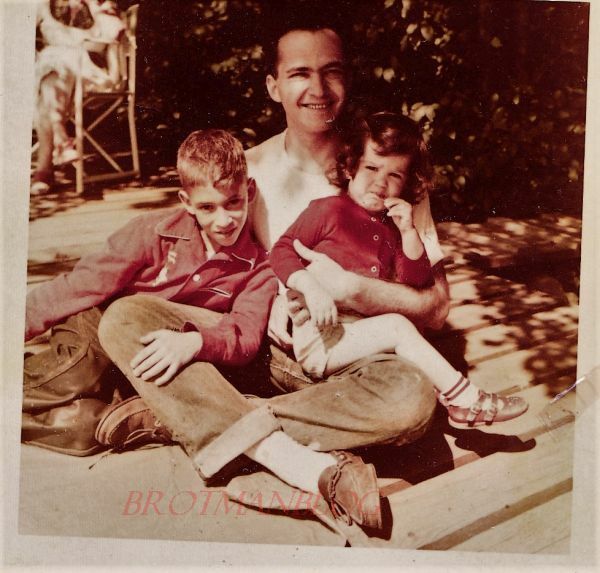 He was born in 1919 in New York and lived in the Bronx in 1920, but by 1925 had moved to Queens, living in the same Jackson Heights neighborhood where his aunt Anna and her husband Burton were living in 1930 and thereafter. By 1930, however, Howard and his parents and brother had moved to Long Beach, Long Island, and were no longer in Queens. They were still living there in 1940. Maybe Howard knew one of Harry’s sons. They were a bit younger than Howard, but Howard lived in Long Beach starting in 1930, and Harry’s sons were in Island Park in Hempstead by 1940. The two towns are about a mile apart, as seen on this map. Howard had a younger brother Alvin, born in 1925, who would have been the same age as David Coopersmith and only a year older than Lawrence and three years older than Samuel. According to the current Island Park School District webpage, today students in Island Park have a choice of attending two high schools in the area, one of them being Long Beach High School. That might also have been true in the 1940s when the Coopersmith boys and Howard and Alvin Halpern were in high school. So my second hunch is that Alvin and his brother Howard knew the Coopersmith sons from Long Beach High School or from Hebrew school or some other community sports or activity. But that doesn’t solve the mystery of why Howard Halpern had Frieda Brotman Coopersmith’s death certificate or Harry’s discharge papers. That the Coopersmith boys had their father’s military discharge papers is somewhat understandable—but why would they have had the death certificate for their father’s first wife, a woman with whom they had no connection at all? And why would Dale’s father Howard have ended up with those papers? I don’t know. But David Coopersmith named his son Lee Howard Coopersmith—perhaps for his childhood friend Howard Halpern? If he was such a close friend, wouldn’t Dale have heard of him? As I mentioned above, I have been in touch with one of Harry’s grandsons, but he had no information that shed light on this mystery. I am now trying to contact Harry’s great-granddaughter, who has a tree on Ancestry. Perhaps she will know. At the very least, she might be able to tell me if the photographs are indeed of Harry Coopersmith. But it’s been almost two months, and she has not responded to me. There is one more sibling of my great-great-grandfather Gerson Katzenstein to research and write about—his half-brother Jakob. But before I move on to the next step in the Katzenstein research, I have several other topics to discuss—updates and items of interest that have accumulated over the months but that were put on the back burner. So the next few posts will be about these varied topics including some interesting discoveries and meetings with cousins. Today I want to talk about two recent meetings with “new” cousins. 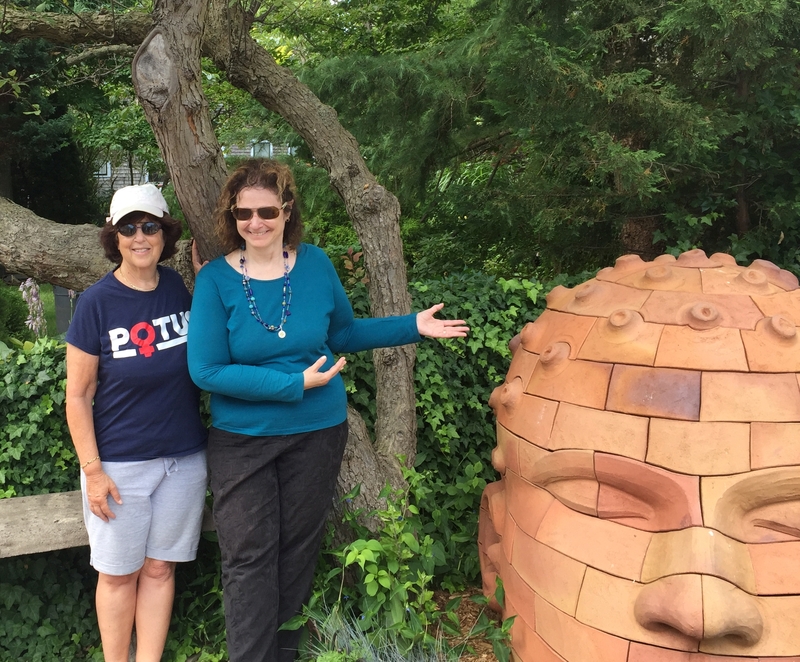 On August 4, my cousin Jan and her husband Richard made a trip to Provincetown to meet Harvey and me and spend the day together. We met them at the wharf where the ferry from Boston arrives, walked around Provincetown, and had a wonderful lunch overlooking Cape Cod Bay and Provincetown Harbor. 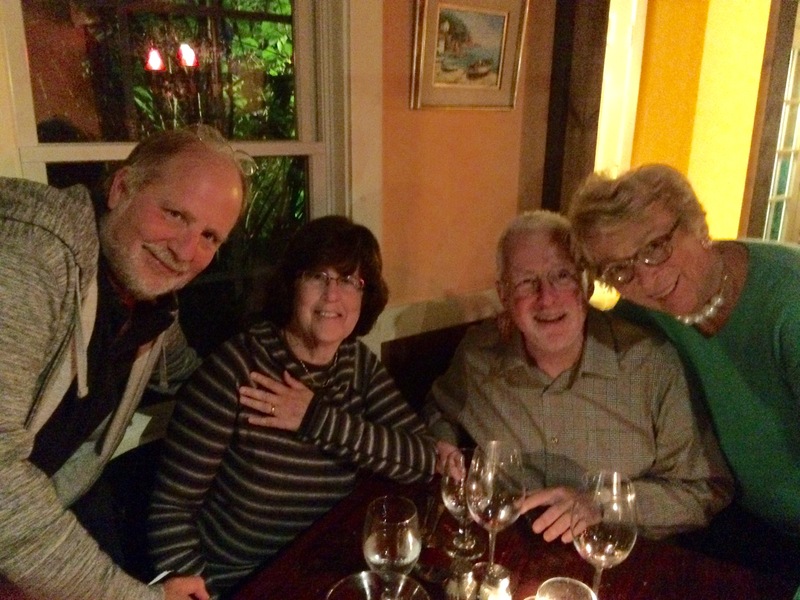 We had a great time together—the conversation flowed naturally, and we all hit it off very easily. Jan is my second cousin, once removed. Her great-grandmother Toba/Tillie/Taube Brotman Hecht was the half-sister of my grandmother Gussie Brotman Goldschlager. I had “discovered” Jan after the amazing breakthrough I had finding my grandmother’s long missing half-sister Toba through the pure serendipity of a list of names in my aunt’s baby book from 1917. 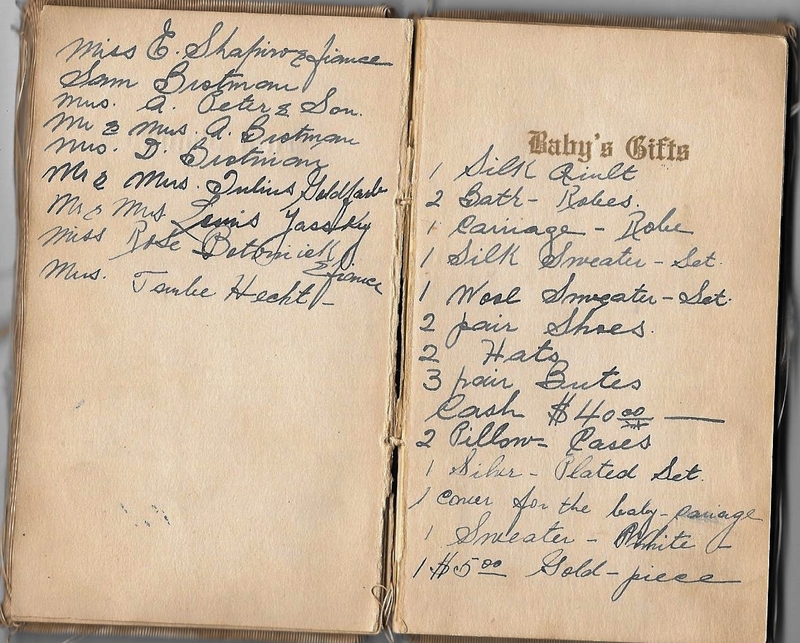 Aunt Elaine’s baby book. Note the last name in the list on the left—Mrs. Taube Hecht; that is my grandmother’s half-sister Toba/Tillie/Taube Brotman Hecht and Jan’s great-grandmother. While we were together, Jan completed a DNA testing kit, which I mailed the next day. I am hoping that her DNA results will help me with my Brotman research since Jan is descended from Joseph Brotman and his first wife and not from Bessie, my great-grandmother. Perhaps her results will help me identify which genes came from Joseph and not Bessie as I search for more answers to the many questions that remain about the Brotmans, for example, about the relationship between Joseph and Bessie. Then on Tuesday, August 8, we had dinner with another “new” cousin, Mike and his wife Wendy. Mike is my fourth cousin through my Hamberg line. We are both the three-times great-grandchildren of Moses Hamberg of Breuna. Mike’s great-grandmother was Malchen Hamberg, who married Jacob Baer; Mike’s grandmother was Tilda Baer, who married Samuel Einstein/Stone, the co-founder with Maurice Baer (Tilda’s brother, Mike’s great-uncle) of Attleboro Manufacturing Company, the jewelry company now known as Swank. I am so excited to read your blog! We are doing research on Samuel Einstein, born in Laupheim, Wuerttemberg. 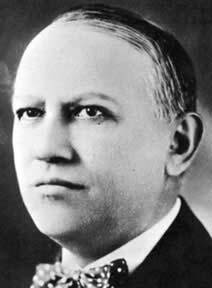 He was connected to Carl Laemmle, founder and president of Universal Pictures, who was also born in Laupheim. Could you please get in contact with me? Thank you so much! I contacted Rainer immediately, excited by this connection to Hollywood since I’ve always been a movie fan and trivia nut. 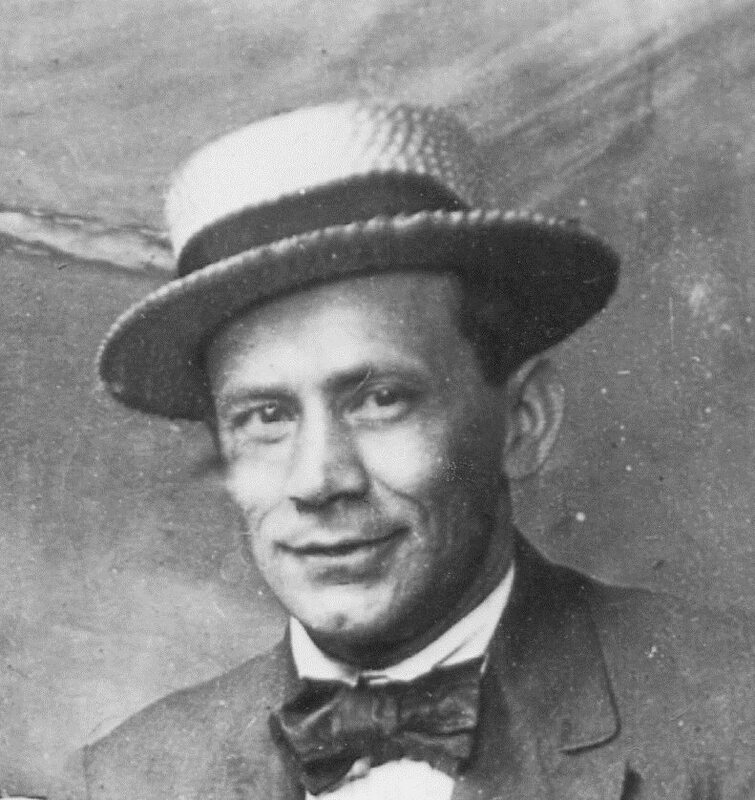 Rainer told me that he was curating an exhibit about Carl Laemmle for the Haus der Geschichte Baden-Wuerttemberg, which is the state museum in Stuttgart for the history of southwest Germany. Laemmle was born in Laupheim, Germany, and had immigrated to the United States in 1884. The story of his career in the United States is quite fascinating (though beyond the scope of my blog). You can read it about it here and here. Rainer wanted to learn more about Einstein, his family, and his connection to Laupheim, Germany, and to Laemmle. I shared with Rainer what I knew, and then I searched for and contacted as many of the Baer/Stone family members as I could, and one of them, Faith, a great-granddaughter of Tilda and Samuel Stone, responded with great interest and then connected me to her cousin, Mike. Thanks to that one comment by Rainer on the blog, I now not only know more about Samuel Einstein/Stone, I also am connected to many more of my Hamberg cousins. Together Rainer, Mike, and I were able to pull together a fuller picture of Samuel Einstein, his family of origin, and his life in Germany and in the United States. Although I won’t go into complete detail here about the Einstein family, I will point out one interesting bit of information we learned that answered a question I’d had while researching the Baer family: how did Maurice Baer and Samuel Einstein end up as business partners? The Baers lived in Pittsburgh, and Samuel Einstein lived in Attleboro, Massachusetts. How could they have met each other? Even today, it would take almost ten hours to drive the more than 500 miles between the two cities. It would have taken days to get from one to the other back then. Well, Rainer discovered that Samuel Einstein had three uncles who lived in Pittsburgh who had been in the US since the mid-19th century. Perhaps Samuel met Maurice Baer when he visited his relatives in Pittsburgh; maybe the Baers and Pittsburgh Einsteins were well-acquainted. If and when I have time, these are questions I’d like to pursue. When Mike learned that I spend the summer on the Cape where he would be visiting this summer, we arranged to have dinner together. It was a lovely evening with Mike and Wendy with lots of stories and laughs and good food. We felt an immediate connection to these warm and friendly people. Mike shared some old photographs and even showed me Maurice Baer’s walking stick. It was a lot of fun. It is always such a pleasure to meet new cousins—whether they are as distant as fourth or fifth cousins or as close as a second cousin. It reinforces the idea that we are all connected in some ways to everyone else, and it inspires me to keep looking and researching and writing. There are so many more cousins I’d like to meet in person—or as Jan said, IRL FTF. Some live nearby, and I hope to get to see them within the next several months. Others live much further away, making it harder to get together. But I’ve gone as far as Germany to meet a cousin, so eventually I hope I can meet many of those who live in the United States. Since Samuel is only related to me by his marriage to Tilda Baer, I had not previously researched his background too deeply. For the same reason, I won’t go into detail here on all that we discovered about his family. 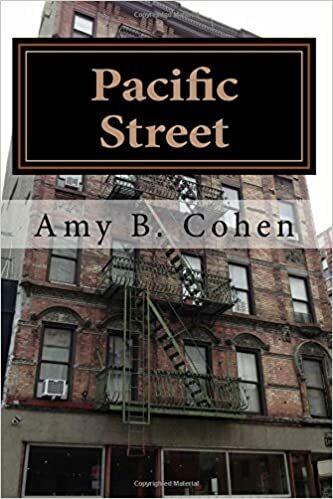 I am very honored and flattered that Luanne Castle, who writes the wonderful genealogy blog The Family Kalamazoo and is a published poet as well, has chosen to blog about my novel Pacific Street. I hope you will read her review and consider purchasing a copy of the book. Thank you, Luanne! 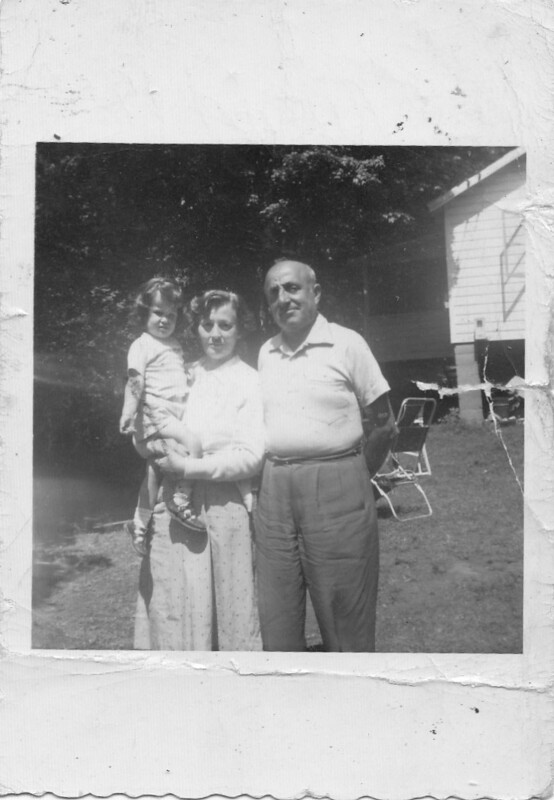 The story of Cohen’s grandparents, Isadore and Gussie, is an inspiring coming-to-America tale with all the resonance of actual experience. Cohen has painstakingly documented the early part of her relatives’ lives through historical research using official documents and has incorporated information shared through family stories. She has researched the settings and cultures described and added her own imagination to infuse the book with appropriate details and descriptions. 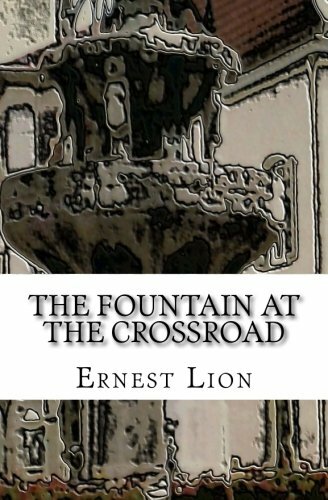 This is no dry historical telling, but a well-structured adventure full of tragedies and triumphs like a novel, although more accurately, it is creative nonfiction in the historical subgenre. As Cohen alternates the narratives of Isadore and Gussie (until their stories merge together near the end), the reader becomes one with the characters. The loneliness of both characters is excruciating, especially since family is so important to both of them. You can read the rest of Luanne’s review here. Check out the rest of her blog while you are there; she is a wonderful storyteller and an expert genealogist. Thank you, Luanne! Your words mean a lot! Some of you know that since I retired two and a half years ago, I’ve been working on a novel inspired by my grandparents’ lives and the discoveries I’ve made about them and their extended families through my genealogy research. Well, I finally put my “pen” down and decided to call it done. It’s been an exciting process for me because ever since I learned to read, I’ve wanted to write a novel. All through my career when I was writing long, boring articles for law journals, I wished that instead I was writing a novel. Novels have been my refuge all my life. I love being transported to different times and places and seeing into the hearts and minds of all kinds of characters. I just wanted a chance to try to create some characters of my own. When I retired, I promised myself that I would give it a try. One friend reprimanded me when I said I was trying to write a novel. She said, “Don’t say that. Say you are writing a novel.” I was and am insecure about the whole thing. I never took a fiction writing course, participated in a writing workshop, or wrote any fiction at all, not since I wrote stories as a young child. What did I know? My only sources of information about writing a novel were all the novels I’d read starting when I read Charlotte’s Web by E.B. White when I was eight years old. That book transported me in ways that changed the way I felt about reading. I cried so hard (spoiler alert) when Charlotte died. And she was just a spider! A fictional spider! How had the author made her so real and moved me to care so much? Now that I’ve written my own novel, I am even more in awe of the many great authors whose books have moved me so deeply. I am humbled by what those authors were able to do with words, and thus I feel presumptuous trying to promote my own book, despite my friend’s reprimand. But it was a labor of love—love for family and love for the magic of the written word. I wrote this book for my children and grandchildren so that they would have a taste of what their ancestors’ lives were like. I had lots of help and inspiration from my family and friends, as I acknowledge at the end of the book. And so despite this aching feeling of insecurity, I do want to share and promote my book so that others will also know the story I’ve created about my grandparents—grounded in fact, but expanded upon by my imagination. If you do read it, I’d love your feedback. Thank you! The best part of my discoveries of the Goldfarb and Hecht families is that I have found more new cousins, three of whom are my double cousins—Sue, Debrah, and Lisa. They are descendants of Julius Goldfarb and Ida Hecht. 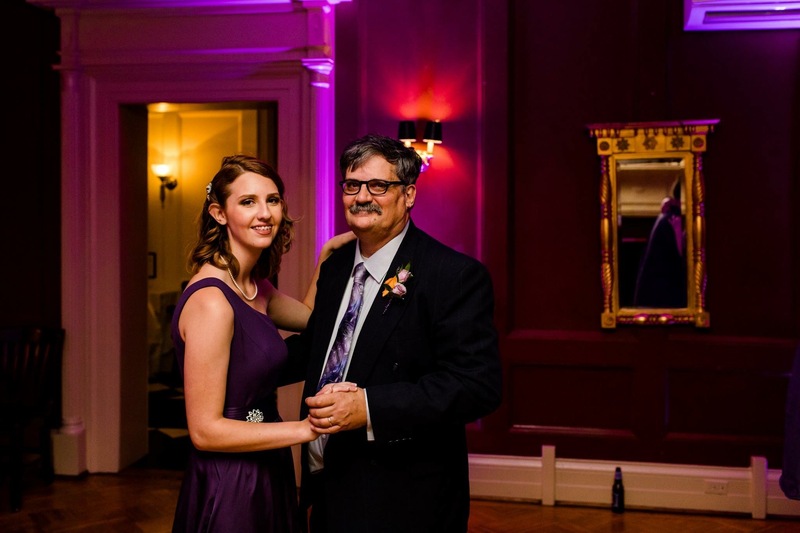 Sue’s daughter Lisa shared this wonderful wedding photograph of Julius and Ida. Julius was the son of Sarah Goldfarb, my great-grandmother’s sister; Ida was the daughter of Tillie Hecht, my grandmother’s half-sister. So I am related to both of them. Julius was the son of Sarah Goldfarb. 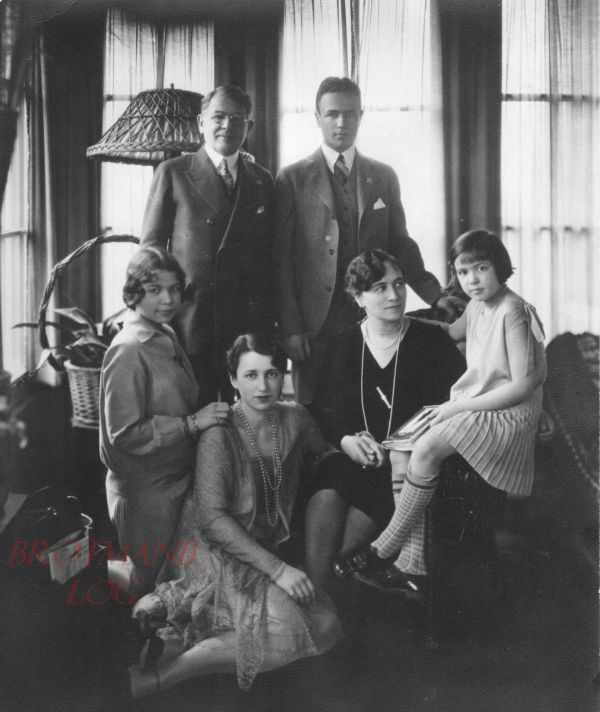 Sarah’s sister Bessie Brotman was the stepmother of Ida’s mother, Toba, as Bessie married Toba’s father Joseph after his Toba’s mother died. Although that makes things complicated, it does not alone create any genetic connection between Julius and Ida since Bessie (and thus Sarah) had no blood relationship with Toba. But if Brotman family lore is correct and Bessie and her husband Joseph Brotman were first cousins, then Joseph Brotman and Bessie’s sister Sarah were also first cousins. Sarah’s son Julius married Ida, who was the granddaughter of Sarah’s first cousin Joseph, making Julius and Ida second cousins, once removed. 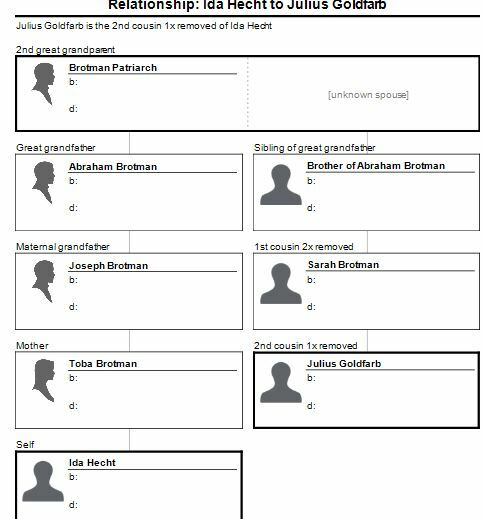 That is, assuming that Joseph and Sarah were first cousins as Brotman family lore reports, Ida and Julius were in fact “distant cousins,” as Hecht/Goldfarb family lore indicates. So maybe together the Brotman family lore and the Hecht/Goldfarb family lore validate each other. Sue and Debrah, who are granddaughters of Julius Goldfarb and Ida Hecht, thus are both the great-granddaughters of Sarah Brotman Goldfarb, making them my third cousins on my great-grandmother Bessie’s side, and the great-great-granddaughters of Joseph Brotman, making them also my second cousins, once removed, on my great-grandfather Joseph’s side. (Lisa is one more step removed on both sides.) Renee is my second cousin; her mother Jean Hecht was my mother’s first cousin; her grandmother Toba was my grandmother Gussie’s half-sister. And then I’ve also found a cousin Jan, whose grandfather was Harry Hecht, Toba’s son, and my mother’s first cousin. And, of course, if my great-grandparents Joseph and Bessie Brotman were in fact first cousins, the relationships get even more convoluted. But I think I will skip that calculation. At least for now. Maybe some brave soul out there wants to try and figure it out? Do you see a resemblance? Unfortunately I don’t have any photographs of Toba’s other full siblings, Abraham and David, to help with the comparison. I can see some similarities—in particular in the shape of the noses. But it appears that Max and Toba do not have faces that are as round as those of their half-siblings. Perhaps the shape of their faces was a genetic trait they inherited from their mother Chaye, not their father Joseph Brotman. 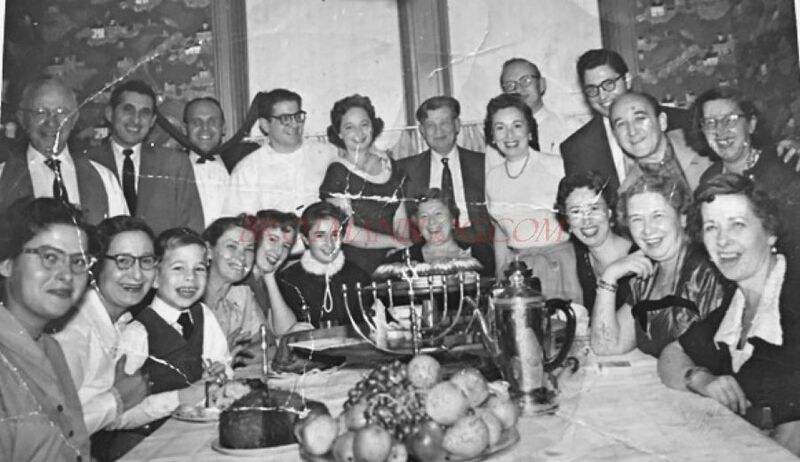 Here is one other photograph of the extended Goldfarb and Hecht family. Standing on the far left is Julius Goldfarb. Seated at the head of the table is Ida Hecht Goldfarb. 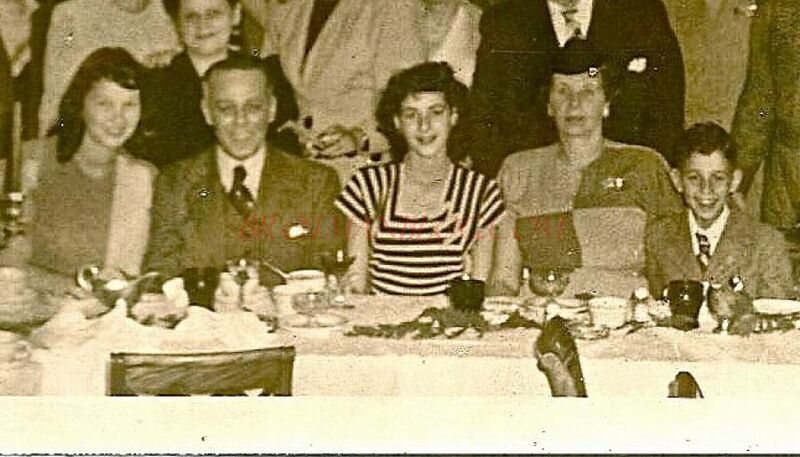 On the right side of the table starting at the front are two of Ida’s sister, Etta and Jean Hecht. Also in the photograph are Julius and Ida’s four daughters as well as their spouses and a few of the grandchildren and other cousins. It’s sad to think that in 1917 Julius and Ida were close enough to my grandmother that they came to visit when my aunt was born, as did Ida’s mother, my grandmother’s sister Toba Hecht, but somehow the families all lost touch, and my mother only has a few memories of some of the Goldfarbs from her childhood. On the other hand, I feel very fortunate that now, almost a century after my aunt was born, I know who the Goldfarbs and Hechts were and I am in touch with a number of these “new” cousins of mine. Finding the woman I believe to have been my grandmother’s long missing sister was definitely one of those high points in my research that I will always remember. I had spent hours and hours searching for the elusive Sophie years before. I had completely given up on ever finding her. I even wondered whether she’d been a figment of my aunt’s very creative imagination. But she wasn’t. My aunt just had the wrong name. That she ended up being named Toba or Taube or Tillie and not Sophie certainly is a lesson in not relying too heavily on family lore, and it is also one of the many perplexing things about this discovery and how it fits with family stories. Hecht family lore said that Taube had two brothers who had arrived in the US before she did, but I have no evidence that there were two Brotman brothers here before 1887 when Taube arrived. Joseph Brotman had three sons in Galicia with his first wife Chaye and one with his second wife, my great-grandmother, Bessie. His oldest sons, Abraham and David, came to the US in 1889, the same year that Joseph immigrated; Max came in 1890. 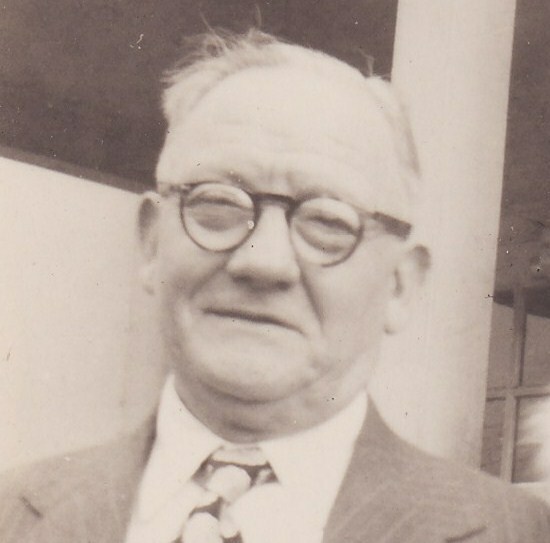 His next son, Hyman, was born in 1883 and came to the US with my great-grandmother Bessie in 1891. None of these European born sons was here in 1887 when Taube arrived, at least as far as I can tell. Of course, it is possible that I have missed a child or missed an earlier manifest. Or it is possible that the Hecht family lore is not correct, just as my aunt’s document naming the missing sister as Sophie is seemingly not correct. I don’t know which is more likely. There’s also the mystery of Eva Singer and Ascher Singer, the two people who sailed from Tarnobrzeg on the Moravia apparently with Taube Brodt. Were they really sailing with her or just bracketed on the manifest to show they were all from the same town? And what happened to the Singers after they got to the United States? More importantly, what happened to Taube after she arrived if, in fact, she did not have two brothers living here already? Did she really go to St. Louis, as Hecht family lore indicates? 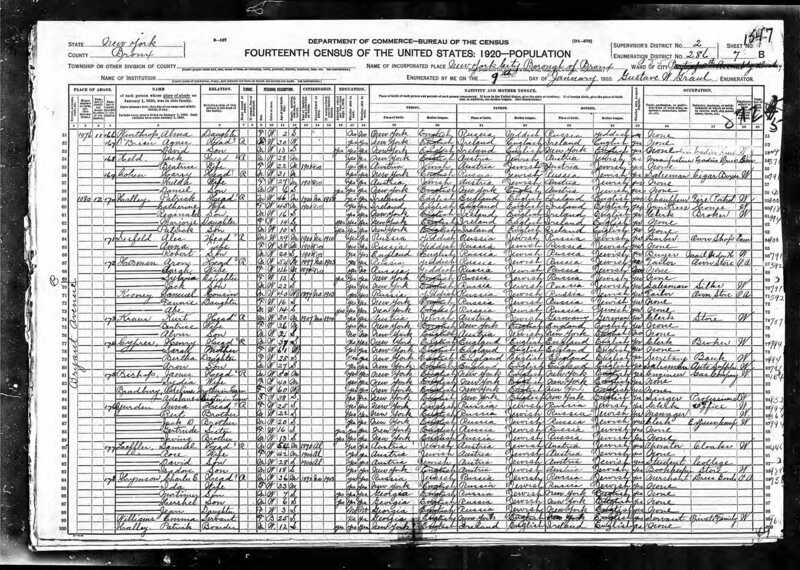 How I wish we had the 1890 census. Perhaps if it still existed, I would have found that my great-grandfather Joseph Brotman was living in 1890 with his four children from his first marriage: Abraham, David, Max, and Taube. 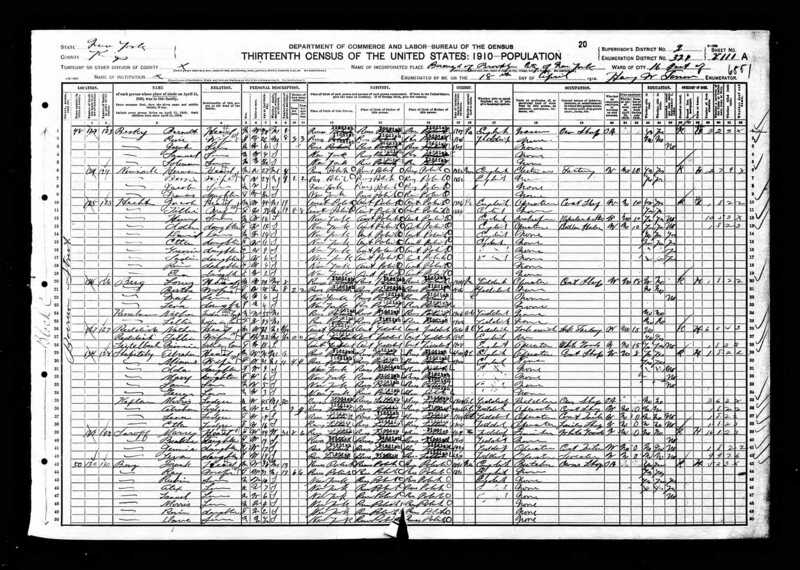 But the 1890 census was destroyed in a fire, taking the answers with it. I searched the 1890 New York City police census and the 1892 New York census on Ancestry, but alas, none of the Brotmans appears on those either. I’ve searched in city directories for both New York and St. Louis, but again with no luck. There is a J. Brodman in the 1891 NYC directory, a “pedlar” living on Ridge Street; that could be my great-grandfather, but I certainly can’t tell for sure; plus it doesn’t help me find Taube as there is no listing for her nor, for that matter, for Abraham, David, or Max. I thus don’t know where Taube was from the time she arrived in the US in 1887 until she gave birth to her first son, Harry, in 1892. But from there on, I have been able to find her story—up to her sad death in 1944. As her death certificate reported. she died from osteomyelitis after a fall on the sidewalk. The Mayo Clinic defined osteomyelitis as follows: “Osteomyelitis is an infection in a bone. Infections can reach a bone by traveling through the bloodstream or spreading from nearby tissue. Infections can also begin in the bone itself if an injury exposes the bone to germs.” According to my medical consultant, today osteomyelitis rarely results in death, but back in 1944, antibiotic treatment was not as effective. Several readers, here and on Facebook, responded to my question with “button holer.” I wasn’t sure what that was, but another commenter did. Bob Brotman (no relationship yet found to my Brotmans) wrote that it meant buttonhole maker, and explained, “In 1910 it was a specialized skill in the sweat shops and worth higher pay than most of the piece work. Women who sewed their own clothing at home would take the almost finished garments to a buttonhole maker for this final touch. Special buttonhole making machines were used commercially in the late 1800’s. Home sewing machines could not make decent buttonholes until the 1950’s.” Live and learn—always something new! But other questions remain unanswered. There is the question of whether Brod, Brodman, Brotman, etc., are different names or different versions of the same name. 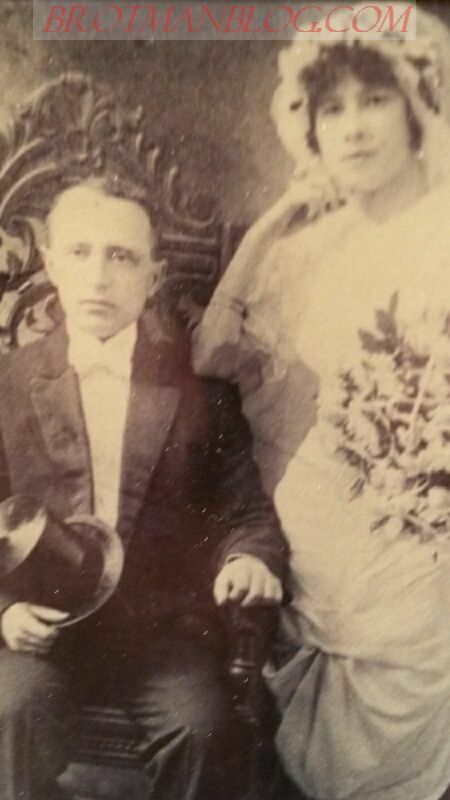 Were my great-grandparents both really named Brod or Brotman? Or was one a Brod, the other a Brotman? I posted a question on the JewishGen listserv about whether Brod and Brotman were the same or different names, and I received conflicting responses. One person, referring to Alexander Beider’s Dictionary of Surnames for the Russian Empire, wrote that Brotman is just another form of the surname Brot, meaning bread or bread man. Another person suggested that Brotman was an Americanization of Brod and that people often forgot the original name once they immigrated. But another person said that they are two different names; this person said Brotman means “bread man” whereas Brot is a toponym for the place where people “ford” rivers, Brodt being a Slavic word for “ford.” And then Stanley Diamond of JRI Poland wrote that both names existed in the Tarnobrzeg region and seemed to come from different families. So I am just as confused as I was before I asked the question. Also, I still don’t know how, if at all, my great-grandparents Joseph and Bessie were related to each other. If they were first cousins, through what relationship? Were their fathers brothers? Or was it that one’s mother and the other’s father were siblings? Or were their mother’s sisters? I don’t know. As has happened time and again with my Brotman line, I can only move forward in inches, but at least I am moving forward. 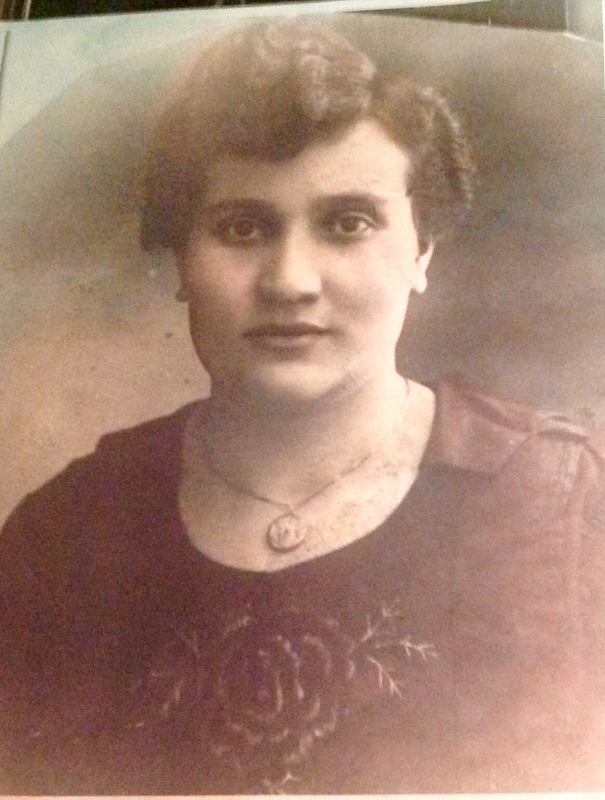 I have found a woman I believe to have been my great-grandmother’s sister—Sarah Brod/Brotman Goldfarb. 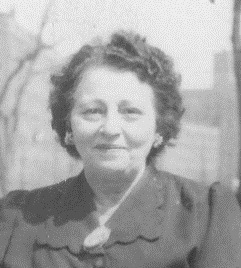 I have also found a woman I believe to have been my grandmother’s half-sister—Toba/Taube/Tillie Brotman Hecht. And it all started with the discovery of my aunt’s 1917 baby book and two names that were not familiar to me. Once again, I am indebted to my Aunt Elaine, who would have been 99 years old tomorrow. Can I say with 100% certainty that I am right about either one? No, but I am probably as right about it as I can get. Having checked again to see if there were any new records discovered in Tarnobrzeg and learning that there have not been (and will not be, apparently), this may be the best I can do. In my next post I will share some of the photos of my Hecht and Goldfarb cousins and compare them to my known Brotman relatives to see if there are any family resemblances. There are still other names in the baby that I will investigate more completely, though nothing has yet turned up that’s been helpful. I was just about to throw in the towel. 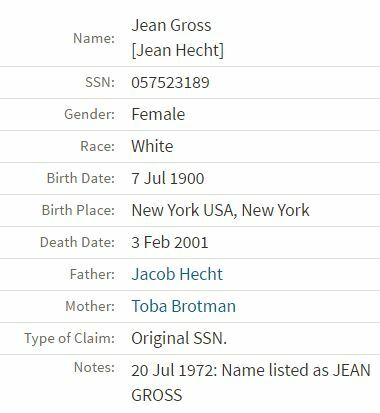 I couldn’t find one additional clue about Taube Brotman Hecht and whether she was related to me. There were no records online to help. 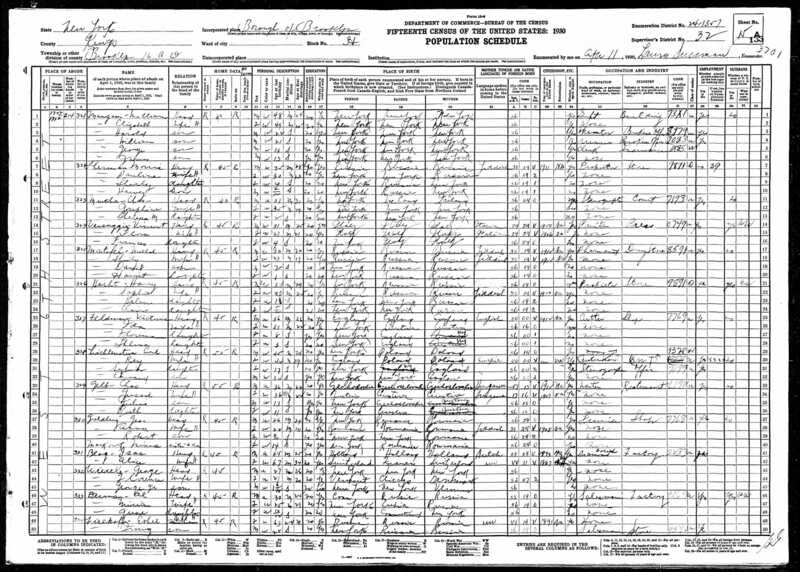 According to the 1900 and 1905 census records, Jacob Hecht and his wife Tillie lived in the Lower East Side and then by 1910 had moved to Brooklyn. Jacob was a tailor, and in 1910 their son Harry was working as a bookkeeper in a department store and their daughter Ida was also employed, but I can’t quite make out her job: operator in a button or butter something? In 1913, Ida married Julius Goldfarb, as noted in an earlier post. In 1915, Jacob and Tillie Hecht and their other seven children were living in the same building as Sam and Sarah Goldfarb, Ida’s in-laws, and Hyman and Sophie Brotman, my grandmother’s brother and his wife. Jacob was working as a tailor, and Harry was working as a salesman; the other children were still in school. Jacob and Tillie Hecht still had the seven other children living with them in 1920, now on East 4th Street in New York City; Jacob continued to work as an operator in a cloak factory and Harry as a salesman in a department store. David Hecht was working as a clerk for the War Department, and Etta, Gussie (listed as Augusta here) and Sadie were all working as stenographers. The two youngest children, Rose (listed as Rebecca here) and Eva, were not yet employed. 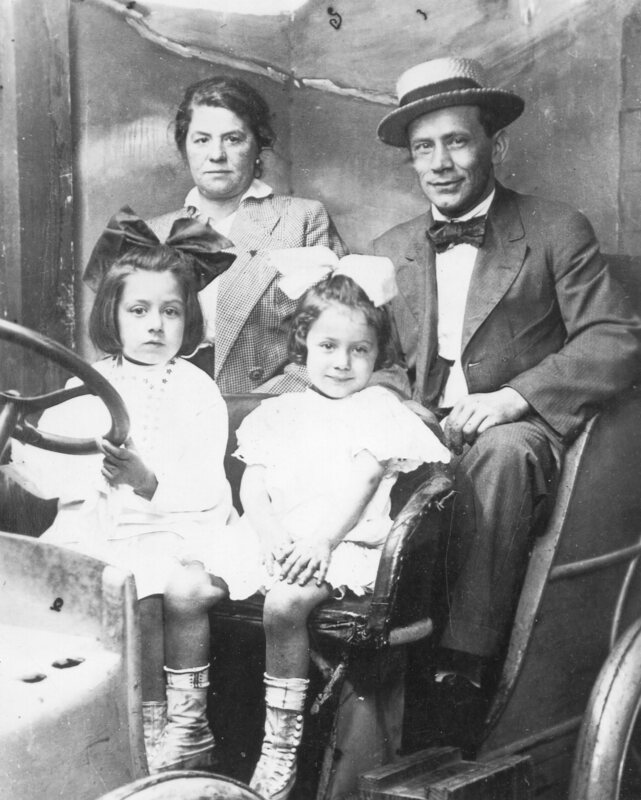 Meanwhile, Ida and her husband Julius Goldfarb and their children had by 1920 moved to Jersey City, NJ, where Julius was in the liquor business. Within five years, almost all of the Hecht family had followed them to Jersey City, including Jacob and Tillie. As you can see from this segment from the 1925 Jersey City directory, Jacob and Tillie were now living at 306 4th Street, and right above their listing is a listing for their son Harry. He was working as a clerk for none other than Herman Brotman: my great-uncle, my grandmother’s brother Hymie. Another piece of the puzzle was fitting together. But there were two other Hechts listed here at the same address as Jacob and Tillie: Jean and Shirley, both working as stenographers. I wasn’t sure which daughter was now using Jean and which was now using Shirley, but I guessed that Jean was probably Gussie and Shirley was probably Sadie. David, Etta, Rose, and Eva were not listed. I could not find them elsewhere either. Was Etta married? Rose and Eva were young enough that they could have still been in school, but where was David, who would have been 29 in 1925? 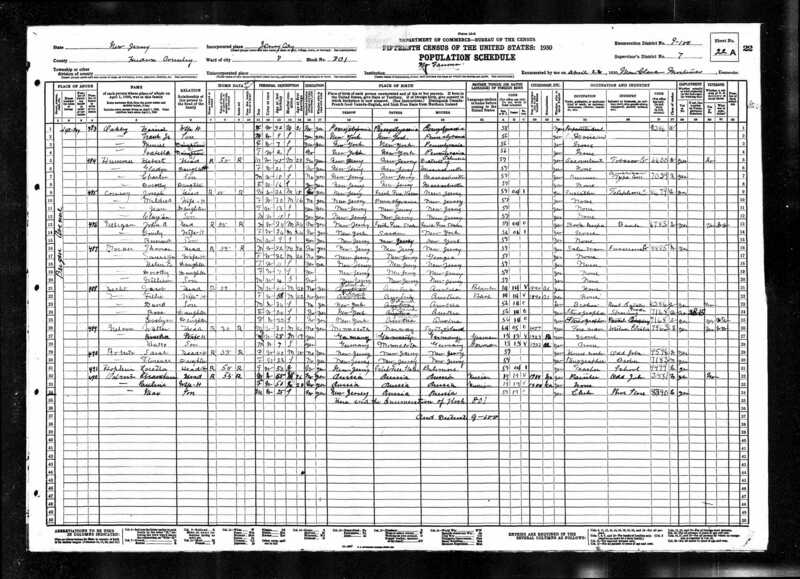 Fortunately, I was able to find a few of the Hechts on the 1930 census, which answered some of those questions. 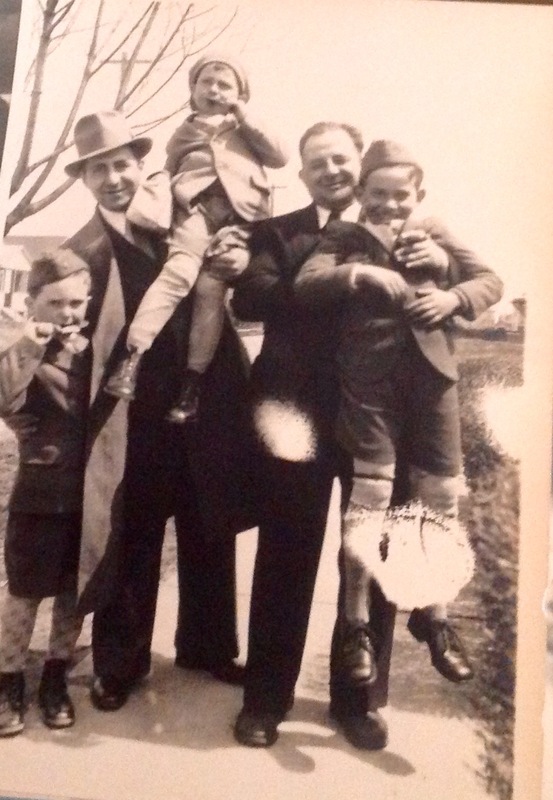 In 1930, Jacob and Tillie were still living in Jersey City with David, Rose, and Eva (listed as Evelyn here). Jacob was no longer working, but David was working as a real estate broker and Rose and Eva were both working as stenographers. Their son Harry Hecht had moved to Brooklyn by 1930 and was now married to a woman named Sophie; they had two children. Harry was the proprietor of a store. As for Etta, Gussie, and Sadie, I assumed they were married, but I couldn’t find them. And at that point I hit a wall. I could not find any of the Hecht daughters on the NYC marriage index. 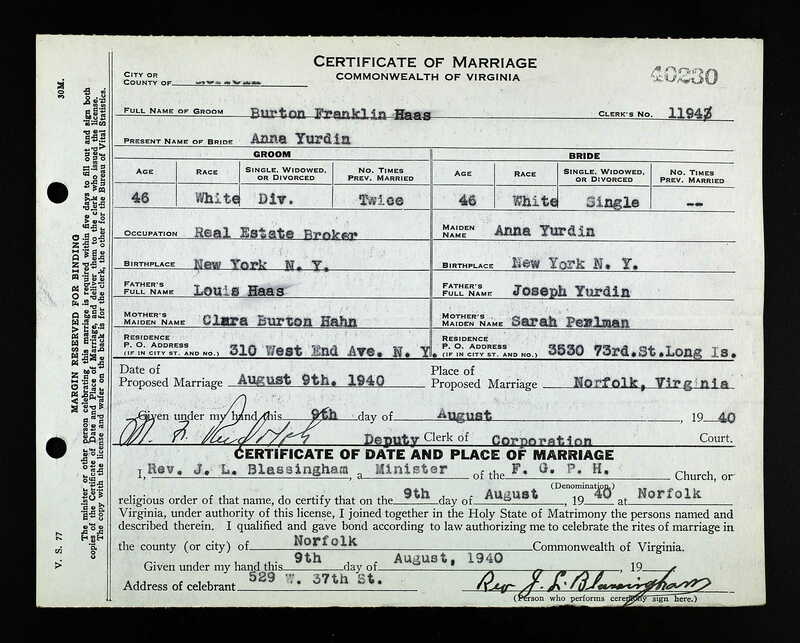 Because the family had moved to New Jersey, and New Jersey has so far refused to put even an index of its birth, marriage, or death records online, there was no simple way for me to find marriage records for them in New Jersey. 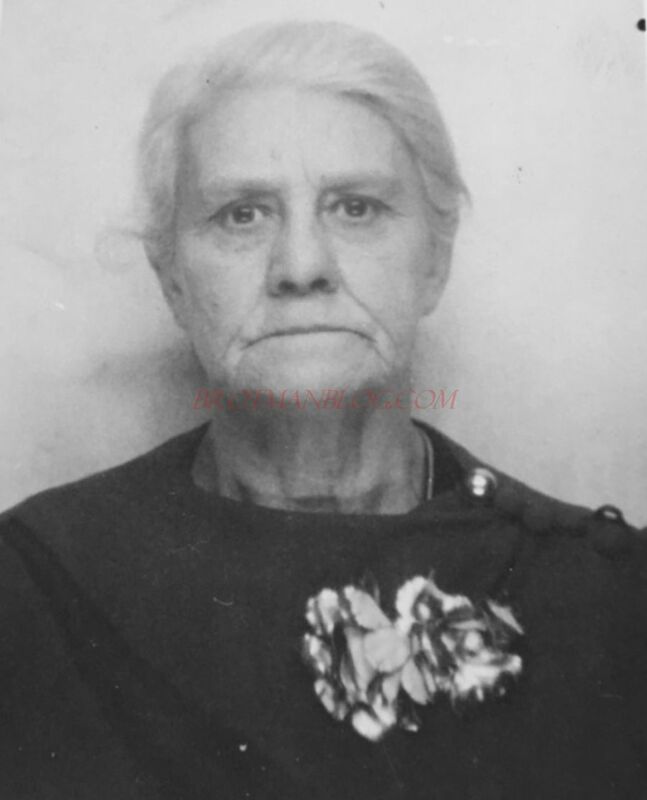 I assumed that Gussie/Jean and Sadie/Shirley had married between 1925 and 1930 and that Etta had married between 1920 and 1925, but paying for a search for these certificates did not seem like a wise use of my resources. 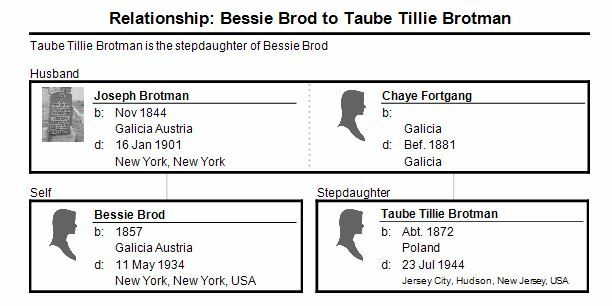 The additional marriage certificates for the remaining daughters might have given me further confirmation that their mother’s birth name was Taube/Toba Brotman, but what I really wanted to know was who Taube’s parents were. And that meant finding either her marriage certificate or her death certificate, not her children’s marriage certificates. But before I could do that, I wanted some rough idea of when she died so that I could make a reasonable request of my researcher in Trenton. That meant finding the 1940 census to see if Tillie Hecht was still alive in 1940. The New Jersey archives allows public access to death certificates up to 1955; I had to hope that Tillie had died in New Jersey before 1955. 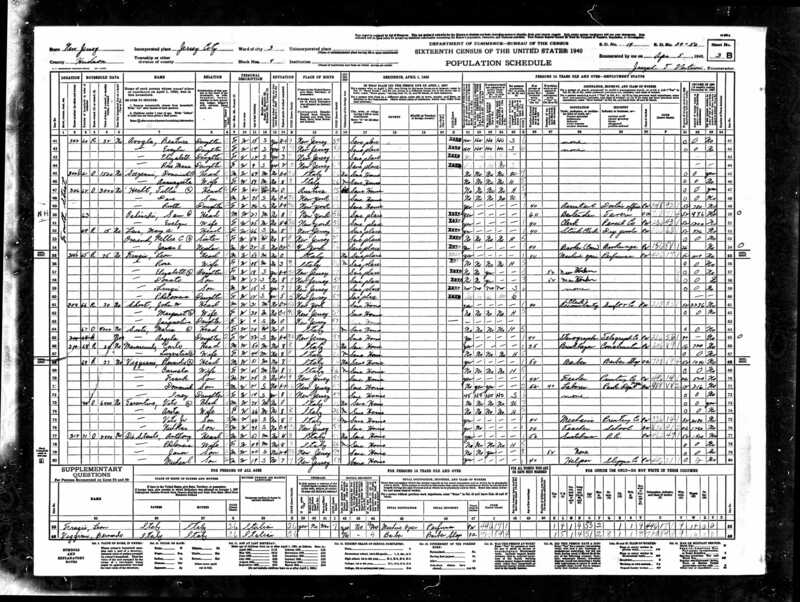 I was able to find Tillie Hecht on the 1940 census; she was still living in Jersey City at 306 East 4th Street. 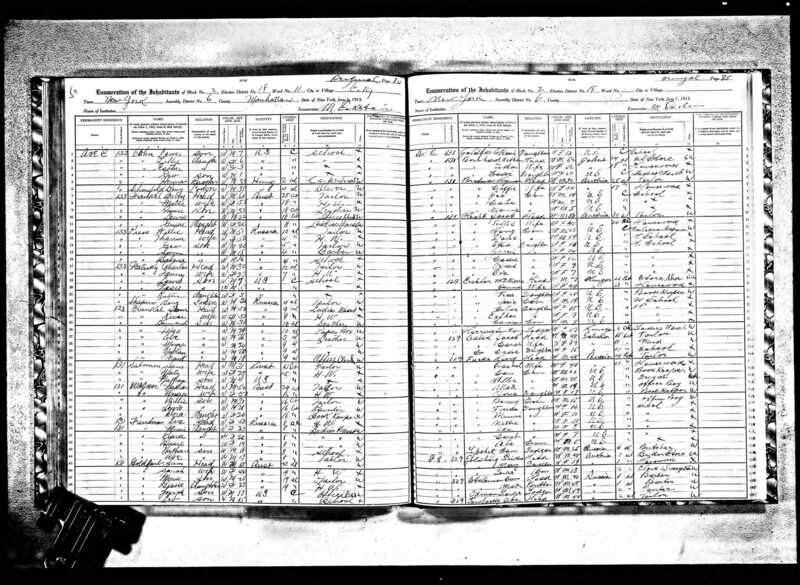 She was now a widow, so Jacob had died since the 1930 census. 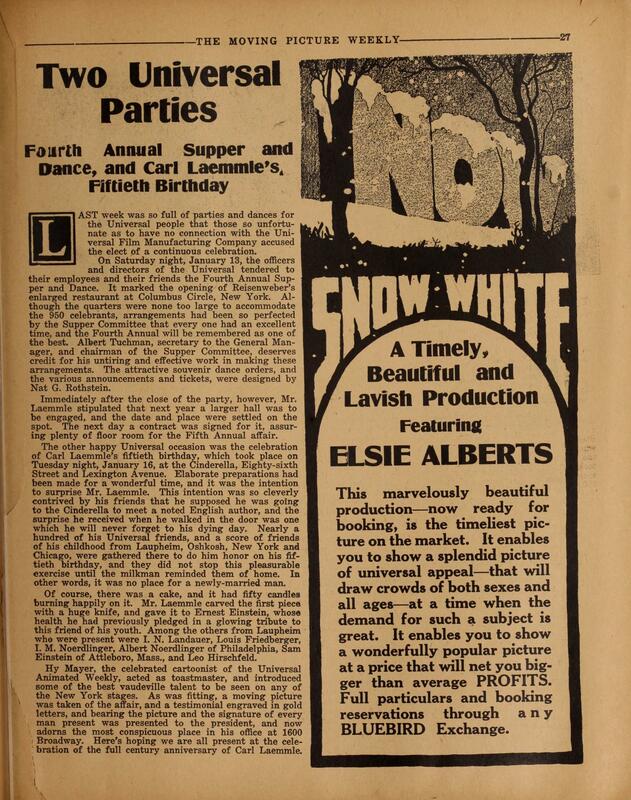 It also says she was sixty years old whereas Tillie would really have been at least sixty-four. There were two adult children living with her: Dave, who was listed as 35 and not employed, and Ruth, who was 26 and working as an assistant in a doctor’s office. David Hecht should have been 45 in 1950, and Rose would have been 36. Had Rose changed her name from Rebecca (1930) to Ruth in 1940? Had Tillie shaved ten years off the ages of herself and both of her children, or was there possibly another Tillie Hecht living in Jersey City, born in Austria? 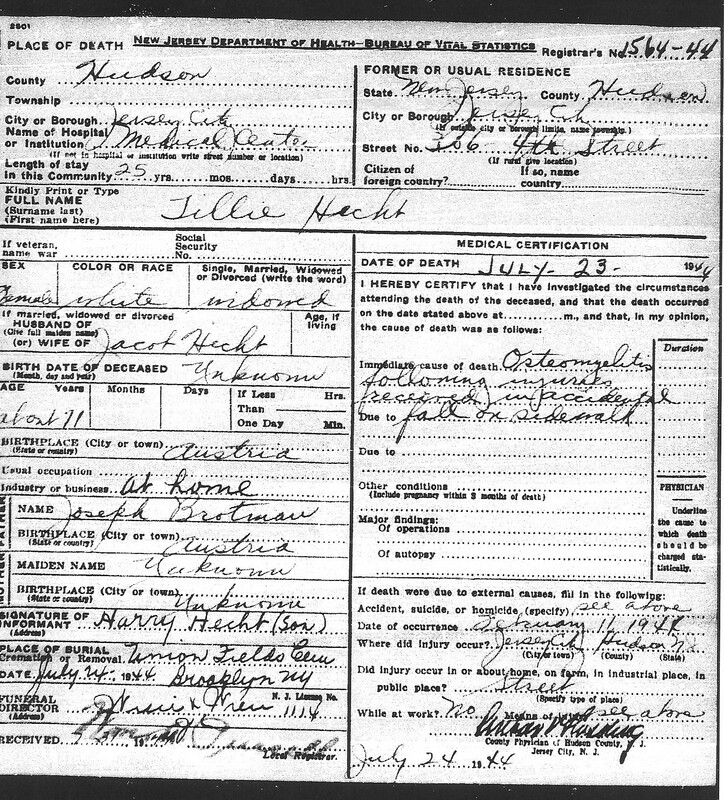 I decided to assume for search purposes that this was the right Tillie Hecht and to ask my researcher to see if she could find a death certificate for a Taube or Tillie Hecht between 1940 and 1955. And then I waited. 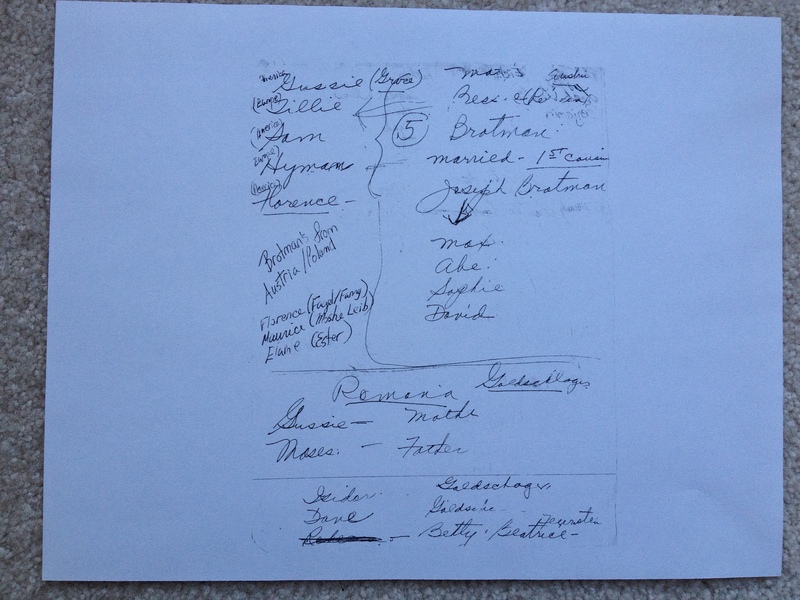 But while I was waiting, I also emailed Tillie’s great-granddaughter Sue and asked her what she knew about her Hecht relatives: what were the married names of her grandmother’s sisters? When did Jacob and Tillie and their children die? Did she know anything else that might help me find out how Tillie Brotman Hecht was related to my Brotmans, if at all? Tillie (Toba) Brotman came to U.S. at 10 years of age she thinks. 2 brothers were already here…redheads …or at least one was. The brothers sent Tillie to a house in St. Louis…to work…learn English, or both. Renee remembers her mother and Aunt Etta (also a Hecht girl) taking the subway to Brooklyn to see “The Uncle” who must have been one of Tillie’s brothers. I read this paragraph several times, trying to sort out what it meant. First, the fact that Tillie had come to the US at ten was consistent with the Taube Brodt I’d found on the 1887 ship manifest, listing Taube as eleven at that time. Second, Renee reported that Taube had had two brothers here already— and that they were redheads. That stopped me in my tracks—my mother, my aunt, my grandmother, my grandmother’s sisters—all were redheads. Red hair is recessive and not all that common. Could this just be coincidence? A Brotman from Tarnobrzeg with red hair had to be related to my family. 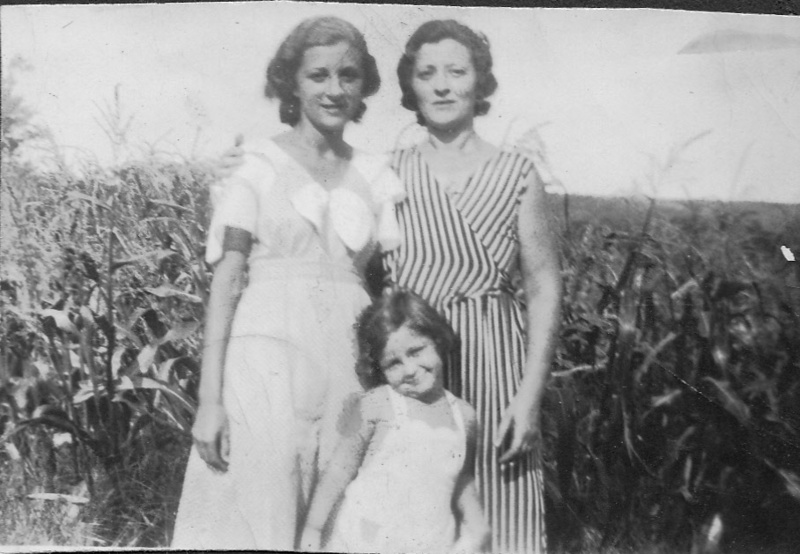 My grandmother with her two daughters, my Aunt Elaine and my mother 1933. All redheads. But who were these two brothers? And why did they send Taube to St. Louis? I had no record of any Brotman from my family arriving before 1887 when Taube Brodt arrived. Renee recalls meeting a cousin also named Renee who she thinks was the daughter of one of Tillie’s brothers. As she recalls, they owned a hardware store on Lexington Ave. and 59th in NYC. Renee thought that both Renees were named for an Aunt Irene. A big, loud bell went off in my slow-witted brain. I knew who that second Renee was. 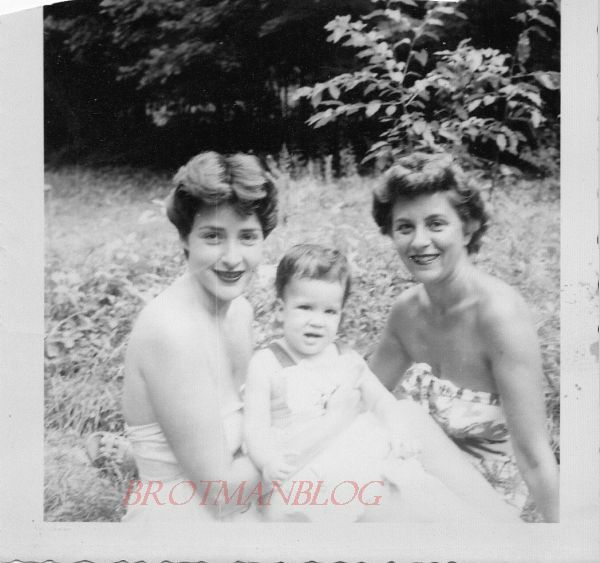 She was Renee Brotman, daughter of Max Brotman, my grandmother’s older half-brother. Renee had married Charles Haber, and they owned a hardware store on Lexington Avenue and 59th Street in New York City. I emailed Renee’s daughter Judy to confirm that that was in fact the address. Max, Sophie, Rosalie and Renee Brotman. Max was my grandmother’s half-brother. Suddenly I knew exactly who Toba Brotman, aka Taube Brodt, aka Tillie Hecht, was. She was my grandmother’s half-sister, the missing sibling I had long ago, years ago, given up on ever finding. I had searched and searched and found not one shred of a clue. I only knew she existed because my Aunt Elaine had listed all of the children of Joseph Brotman, including those with his first wife Chaye, on her family tree. There had been a daughter named Sophie, according to my aunt. My aunt had all the other names right—could she have been mistaken about Sophie’s name? Was it really Toba or Taube or Tillie? 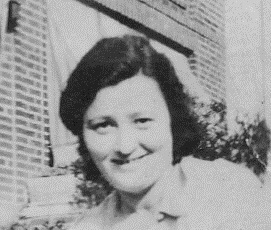 Plus there was another thing that troubled me: if Tillie Hecht was really my grandmother’s sister, it meant that my grandmother had two sisters using the name Tillie: her full sister Tillie, the one my mother knew well, Tillie Brotman Ressler, and this other half-sister Tillie Brotman Hecht. How could there be two sisters with the same first name? Tilly Brotman Ressler 1944. My grandmother’s sister. And also a redhead. And who was this Aunt Irene that the two Renees were named for? A clue for that came from my cousin Judy; she said her mother Renee had originally been named Ida, but it was changed to Irene soon after she was born. Irene then evolved into Renee. When I saw “Ida,” I recalled that Ida was often a secular name for girls named Chaye. 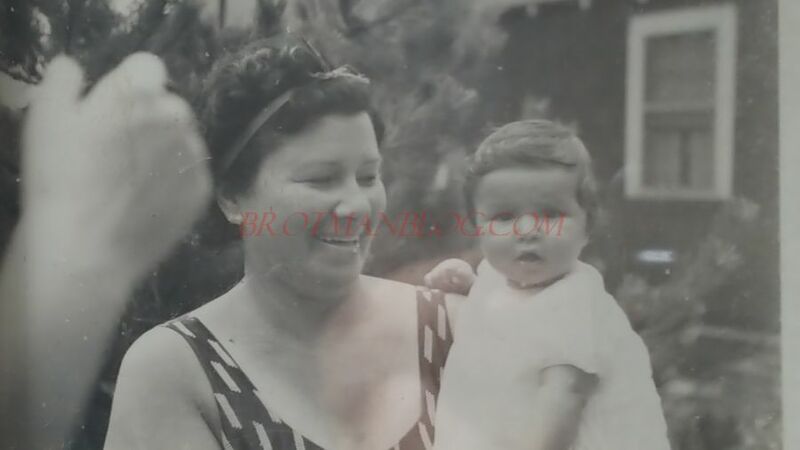 Chaye was the name of Joseph Brotman’s first wife, the mother of Abraham, David, Max, and “Sophie.” Max Brotman had named his daughter Ida (then Irene) for his mother Chaye. If Tillie Brotman Hecht was in fact “Sophie,” it made sense that she also named her first daughter Ida for her mother Chaye. It all made sense. But I knew better than to rely on family lore. I needed some kind of official record to back up my hypothesis. Her father was Joseph Brotman, my great-grandfather. Tillie Hecht, born Toba Brotman, was my grandmother’s half-sister. The Hecht children, all eight of them, were my mother’s first cousins. I had found the long missing Sophie, only she was really Toba. There were still questions to address, but for the moment, I just was content to wallow in the joyous mud of discovery.